Necklaces have existed ever since our ancestors began to walk upright. 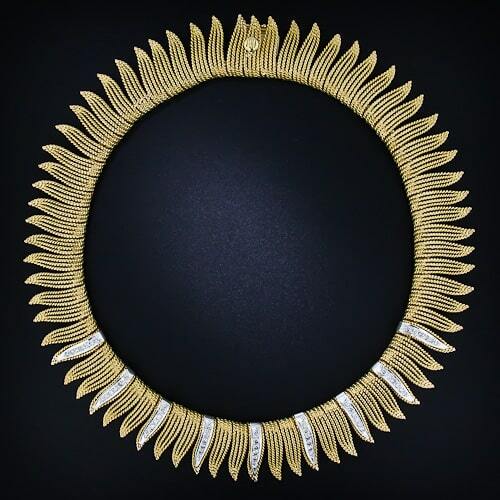 Our desire to adorn ourselves has been evident since ancient times with Paleolithic and Neolithic necklaces made from shells, bones, teeth, and claws found at sites of archaeological explorations. As our sophistication and knowledge grew so did the variety of materials and the level of detail and design used in jewelry. The Greeks, Romans, Egyptians, virtually all civilizations, had unique methods for designing and making jewelry, ranging from simple strung bead arrangements to more elaborate combinations of materials and patterns. Ancient Egyptians favored a “broad collar” comprised of beads strung in vertical, parallel rows fashioned in a bib-like shape, tied with a cord at the back. Heavy funerary collars were created from metal sheet and chased with talismanic Egyptian motifs. 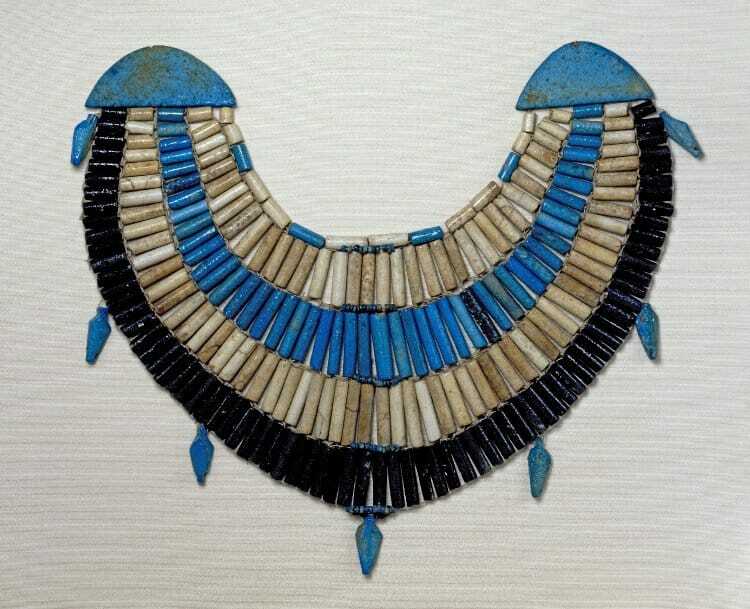 Strings of beads tied in the back with a cord were worn choker style and pectorals designed as large emblematic motifs were inlaid with faience and gemstones. Gold Repoussé Bula Pendant Necklace c.400-350 B.C. The Minoan civilization stamped out gold beads to create many different forms of jewelry. 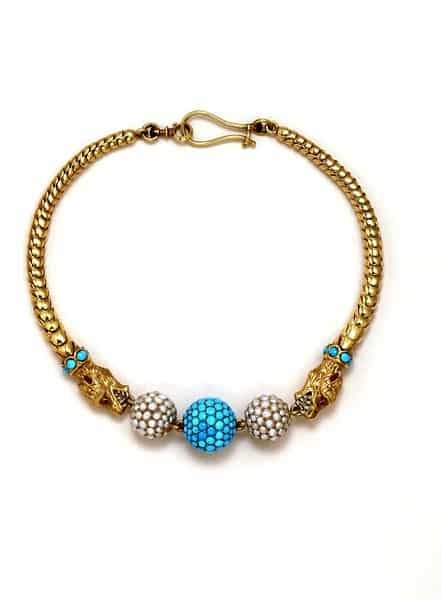 Necklaces and pendants featured beads decorated with complex granulation and repoussé. An Egyptian influence was evident in their choice of pectorals and the motifs that they created and adorned with an expert use of filigree. 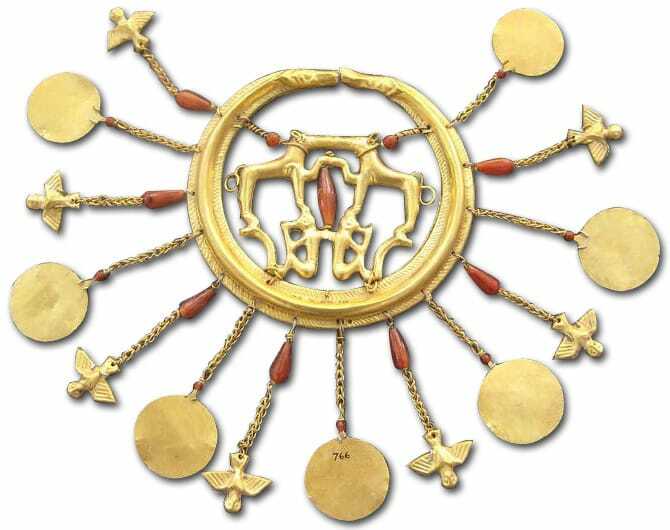 Large gold disks with repoussé animals were often suspended from the pectorals. The Minoans were also clever chain weavers and, as a result, chains began to be worn as necklaces in their own right without the addition of charms, pendants or other symbolic motifs. The Etruscans were the ancient world’s most accomplished goldsmiths. Fabulous necklaces included the art of chain making further embellished with a myriad of repoussébeads with intricate granulated designs. When discovered centuries later, jewelers tried in vain to emulate the fine work of the unparalleled civilization. The techniques they used for accomplishing such incredible granulated designs frustrated generations of jewelers who strove tirelessly to recreate the magic. 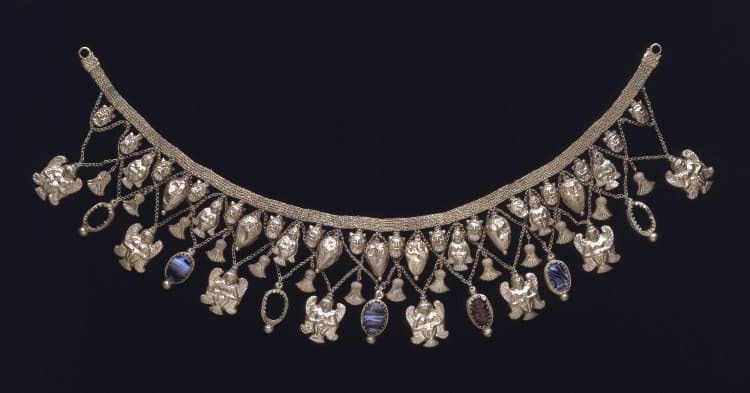 Classical Greek necklaces linked together repoussé motifs sometimes decorated with filigree and granulation and suspending hollow forms such as amphorae, flower buds, beads, flowers and human heads. Medallions with elaborate designs were suspended from chains featuring these incredible repoussé motifs along with swags of chain. 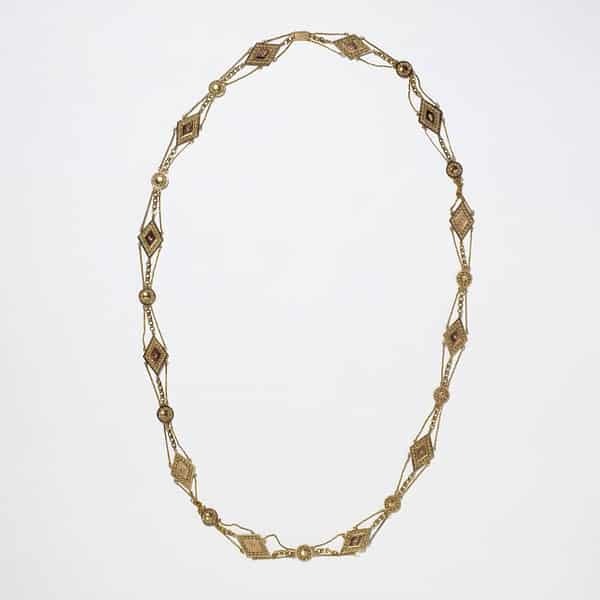 Their interpretation of Etruscan design adapted the strap necklace but replaced the pendants with more geometric forms abandoning the Etruscan figurative motifs. More gemstones were being used and chains included finials and gold, glass and gemstone beads. Roman jewelry design was of Hellenistic origin until the 2nd century A.D. when Roman jewelers began to use the technique of opus interrasile resulting in an openwork pattern in metal. They also took the art of niello and applied it to jewelry. Romans were responsible for adding a good deal of color to jewelry using colored stones polished en cabochon. Chains suspended coins and medallions and included colored stones and segments pierced with the opus interrasile technique. 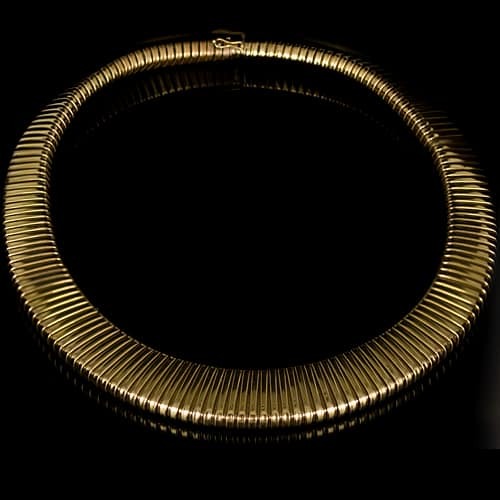 Early Celtic necklaces included torcs of twisted rod or ribbon held in place by a simple clasp. 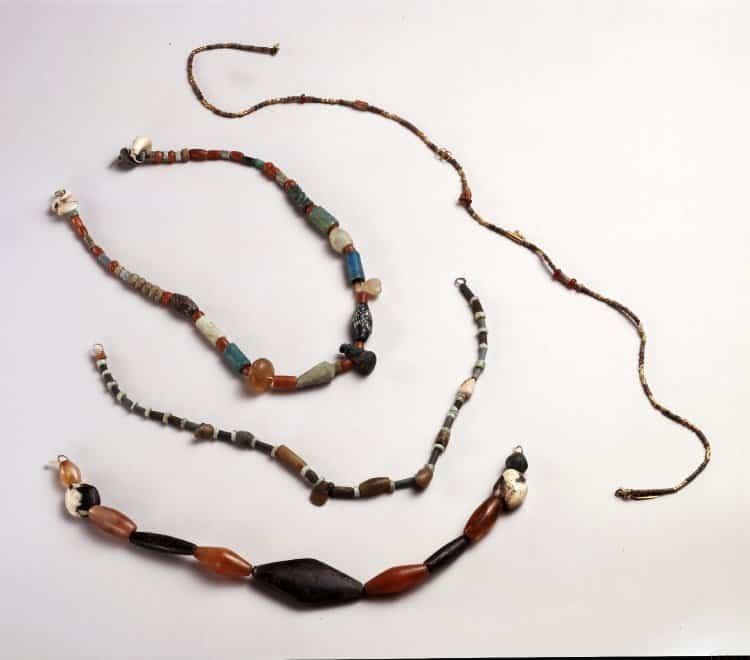 Trade with other parts of the world brought them beads made from faience and amber which they fashioned into necklaces. Similar to a pectoral was the Irish gorget, designed as a broad crescent cut from sheet metal and enhanced by repoussé work and finished with large disk-shaped terminals. Scandinavian Jewelry c.6th century featured elaborate and intricate abstract themes which included their use of a technique called “chip cutting” which involved chiseling glimmering facets onto gold surfaces. Combining this with filigree and repoussé resulted in a heretofore unseen style. With the passing of time, simpler geometric designs emerged. 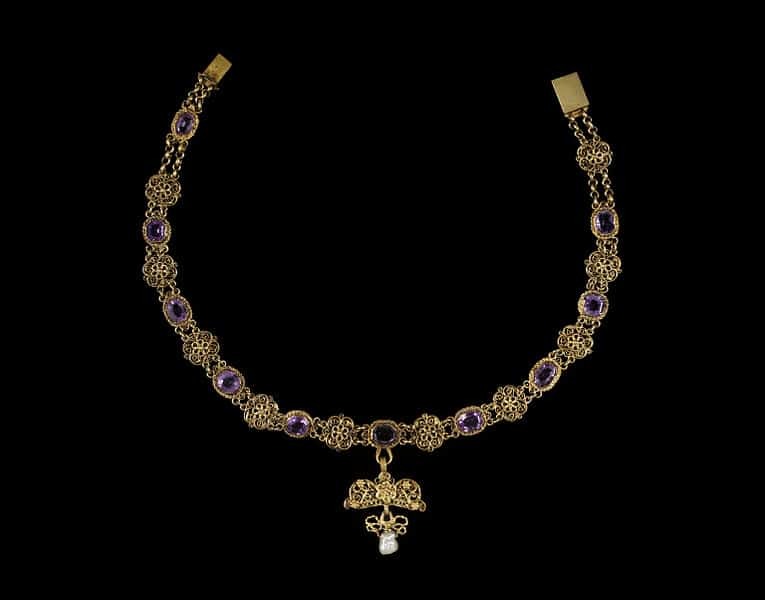 Roman Amethyst, Emerald, Blue Glass and Gold Necklace c.3rd Century. 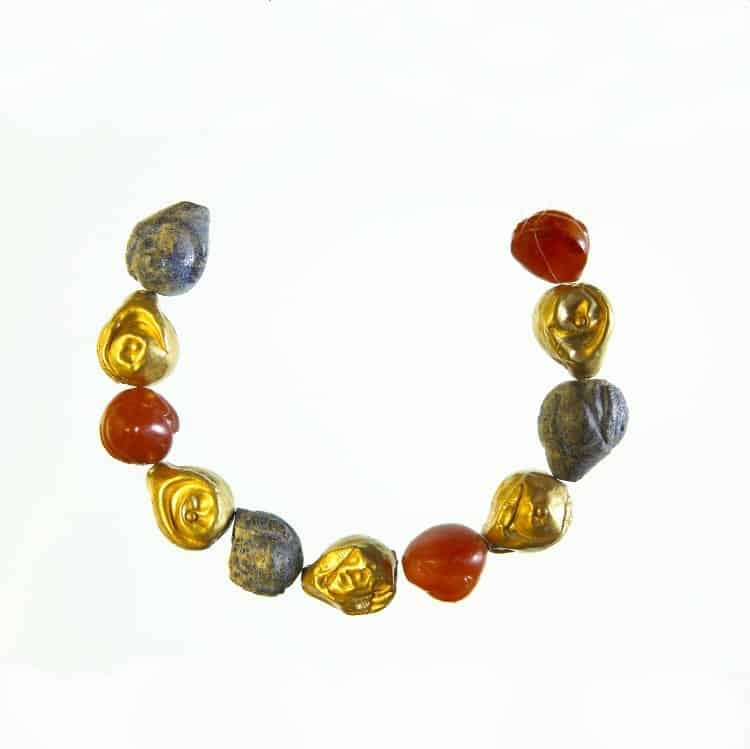 Late Prehistoric Beads from Ur (Iraq) c.4000 BC. Simple bead strands of stone and glazed composite material. Lapis and Gold Beads, Ur c.2600 BC. 4th Dynasty Bead Collection c.2613-2494 BC. Gold beads included in more elaborate bead strands. 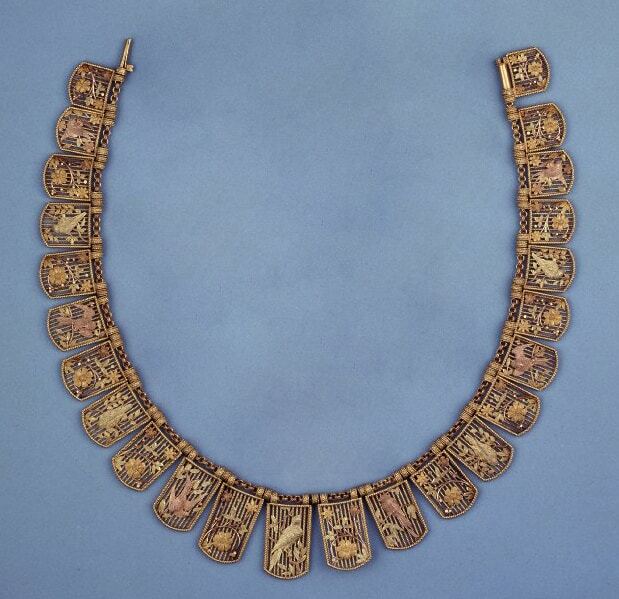 Egyptian Broad Collar c.2020 BC. Broad Collar Rows of nearly vertical tubular beads with the lowest row suspending drops shaped like leaves or mummiforms. Gold elements: discs, cylinders, bicones and globs. 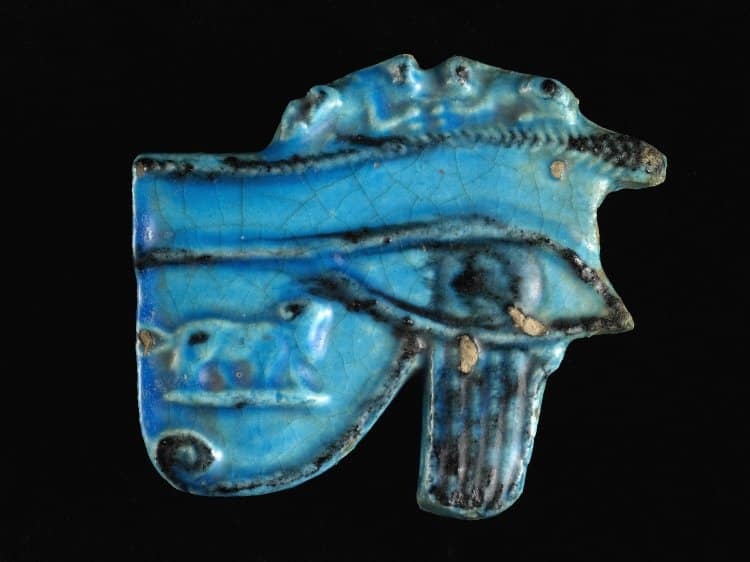 Egyptian Blue Glazed Pectoral BC. Pectoral – large, often trapezoidal, pendant suspended from a string of beads. This evolved to become the cartouche. Bright colors and bold shapes were common. 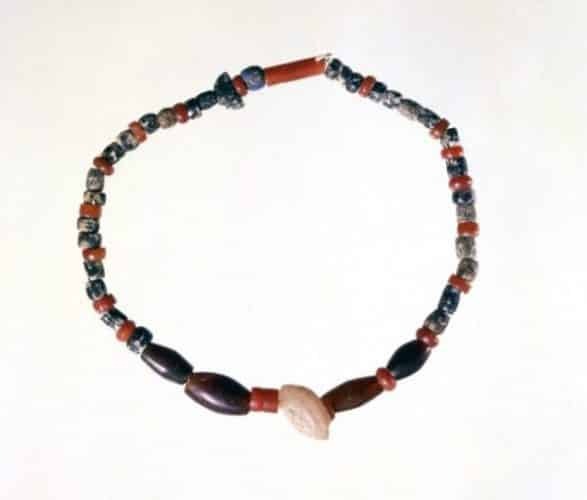 Minoan Lapis Lazuli, Carnelian and Gold “Breast” Bead Necklace c.1700-1500 BC. Lotus flowers, lilies, chains and animals made of gold were common themes. 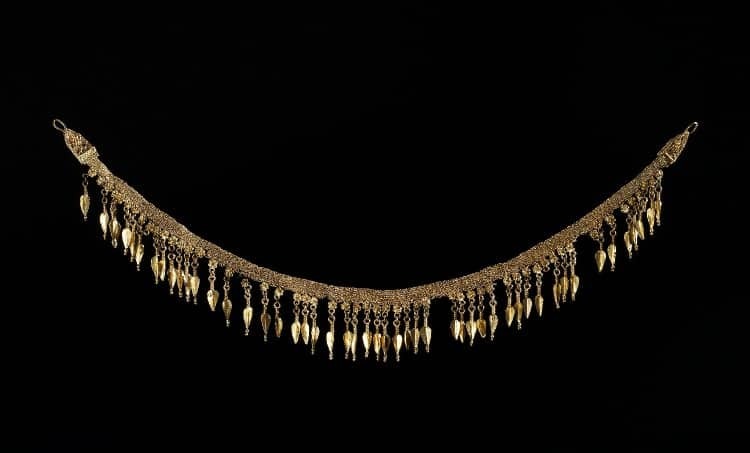 Minoan Gold Chain with Repoussé Pendants c.1700-1500 BC. 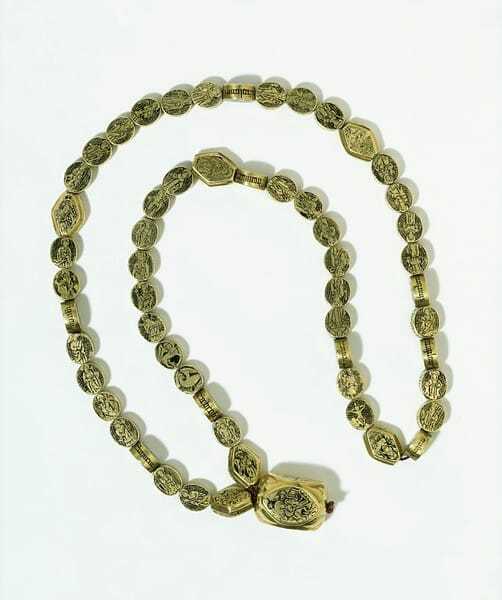 Stamped from sheet: rows of beads and designs in gold, some with granulation, (including scrolls, leaves, flowers, and fruit) were mass produced. 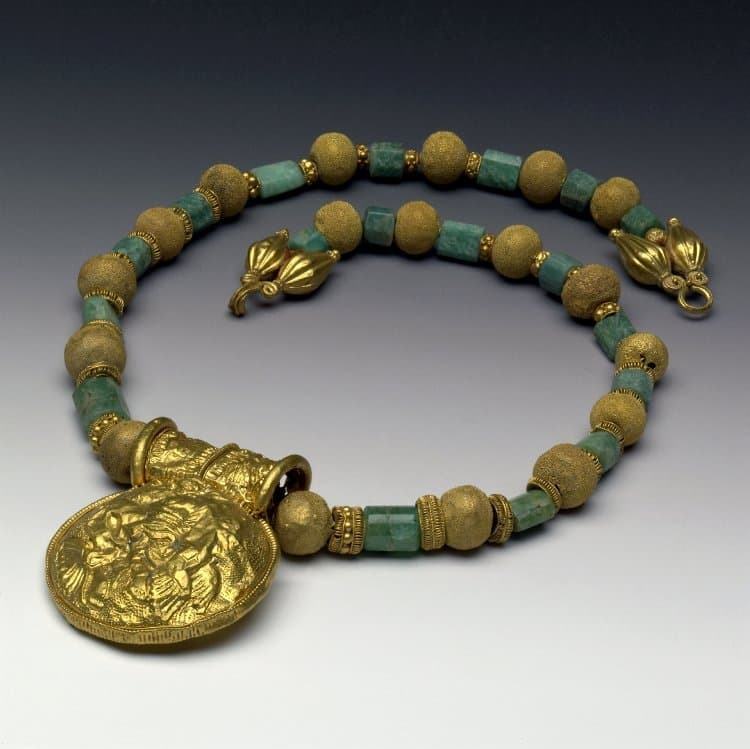 Late Cypriot Gold and Glazed Composition Necklace c.1550-1050 BC. High-quality gold jewelry with stone inlay. Casting, repoussé produced beads of many shapes. Heavy embossed collars were made of gold plaques. 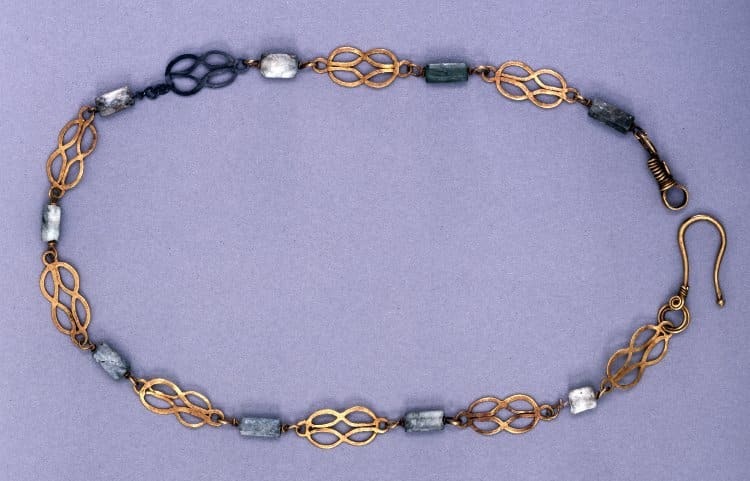 Greek Necklace with Chain, Beads and Pendants c.8th century BC. 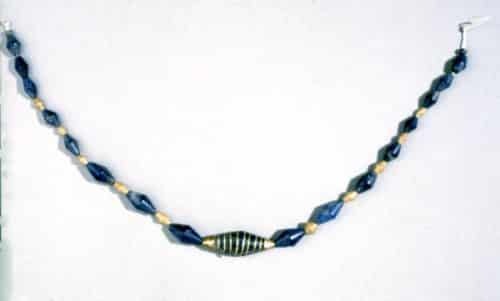 Beads of glass or faience with gold, silver or electrum were worn in strands. Embossed pendants with geometric motifs. 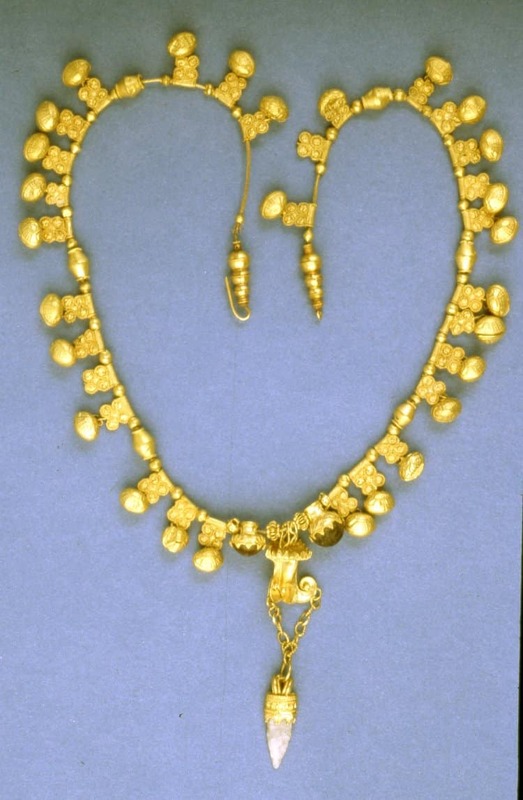 Hellenistic Gold Necklace with Square Pendants. c. 500 BC. Swiveling scarabs were soon replaced with seals carved in rock crystal and amber. Mesh chains with granulated and plain gold beads. 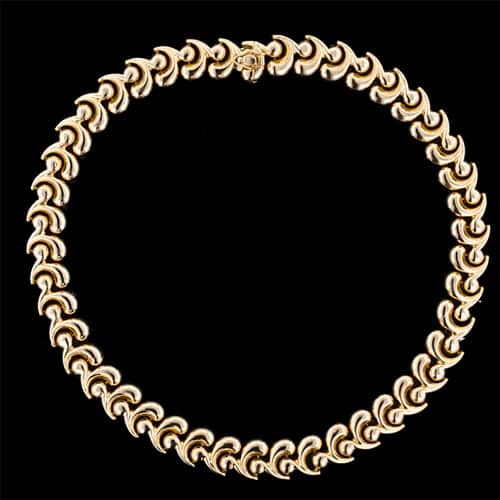 Gold strapwork necklaces with looped chains suspending various pendants. 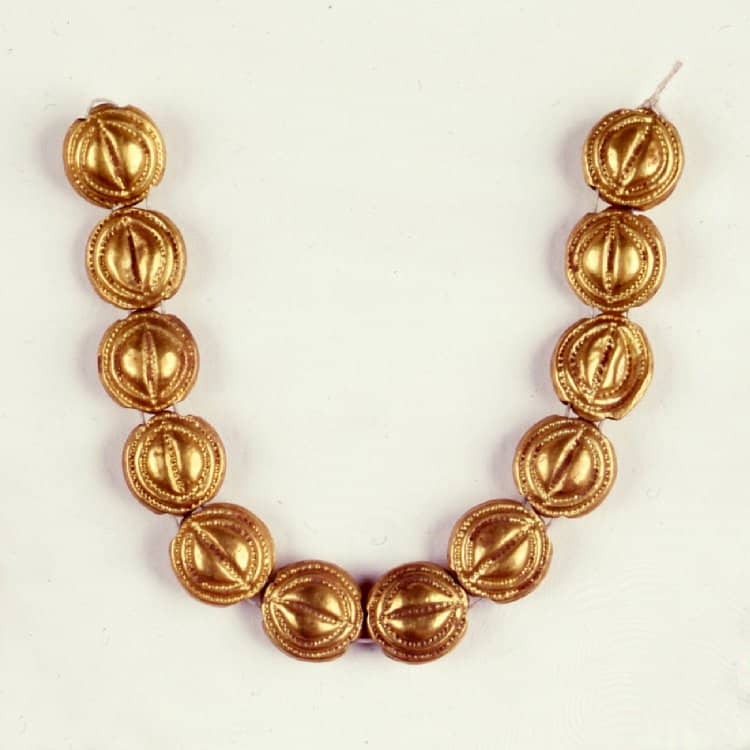 Bulla, Gold and Plasma Bead Necklace c.5th-2nd Century BC. Large pendants surmounted by a tubular element for stringing included flowers, anchors, amphorae and mellons. Hellenistic Strap Necklace Suspending a Fringe of Seed Shaped Pendants. c.300BC. Strap Necklace: many fine chains linked together suspending a fringe of pendants. Bronze Italic Pendant c.700-900 BC. Gold was scarce so many jewels were made in silver and bronze. All styles: earrings, bracelets, rings, necklaces etc. Festoons linking numerous elements to form a necklace. Long linked chains with animal head terminals, sometimes with glass beads. 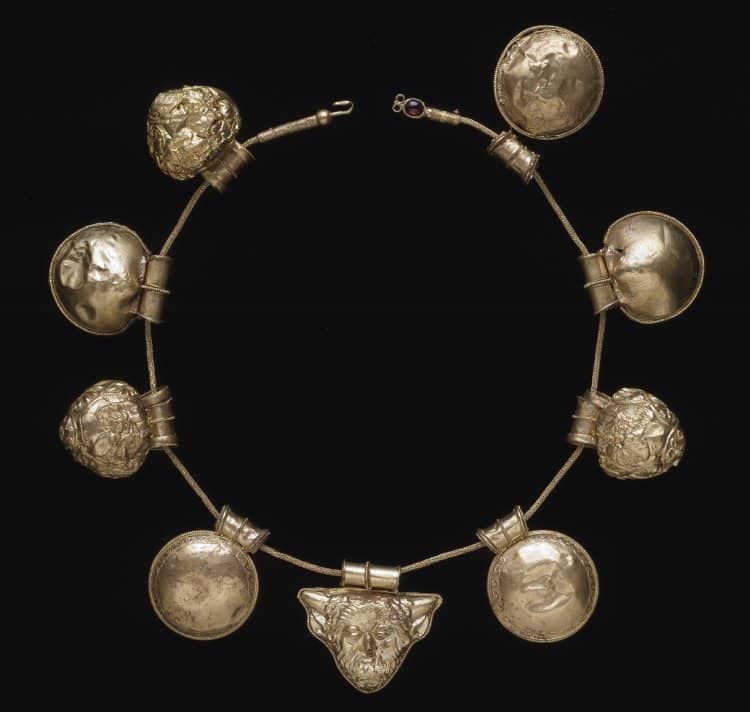 Italian Chain with Lion Head Terminals and Hook and Eye Clasp c.300 BC. The use of a clasp composed of a ring and a hook began to replace ribbon or string for tying a necklace onto the neck. Emerald, Garnet and Gold Hellenistic Necklace c.200 BC. 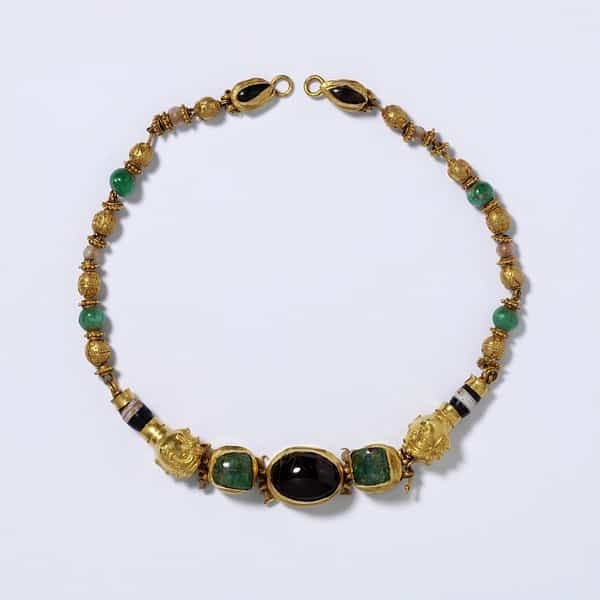 Use of color in jewelry became increasingly important to the Greeks. Gemstones or colored glass were added to gold necklaces. Necklaces were worn close around the neck and tied at the back with a ribbon. Often multiple necklaces were worn together. 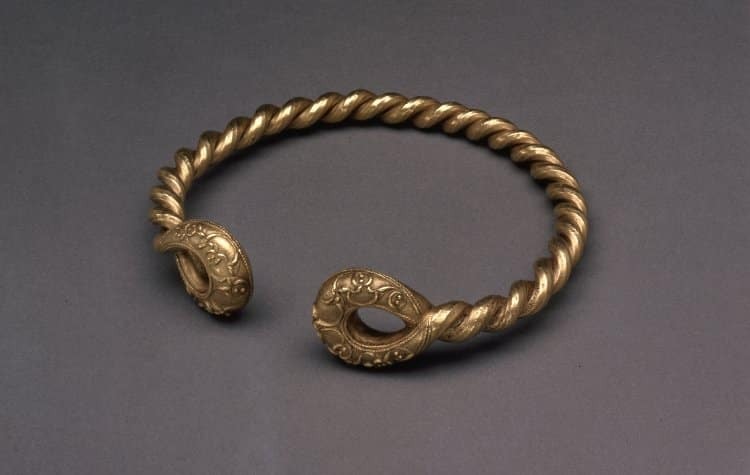 Gold Alloy Torc with Loop Terminals and Twist Design c.75 BC. Torcs designed as an open ring with decorative terminals or twisted ring with loop terminals. Roman Emerald and Gold Necklace c.2nd-3rd Century. 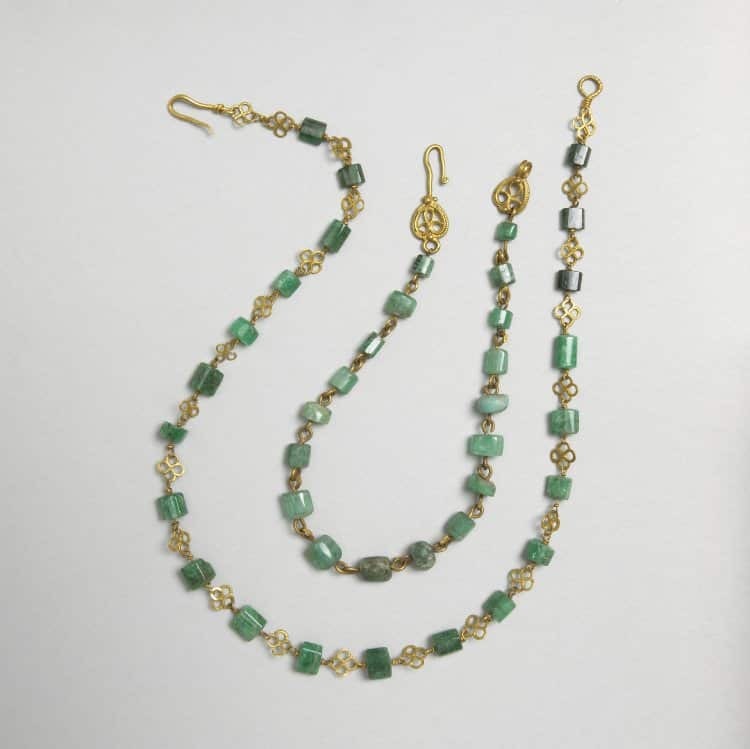 Link chains with stone beads. Medusa Gold Necklace c.200 AD. Wheel motif pendants and finials. Colored gem cabochons in wide bezels, with pearls and gold links. During the Dark Ages the tribes of Europe (Visigoths, Ostrogoths, Franks, Anglo-Saxons, and Lombards) employed their highly skilled armorers as jewelers. All the techniques of the earlier civilizations were known to these craftsman but it was their use of inlaid colored gemstones in a cloisonné fashion that set them apart. They rivaled even the Egyptians when creating mosaic stained glass window-style jewels. 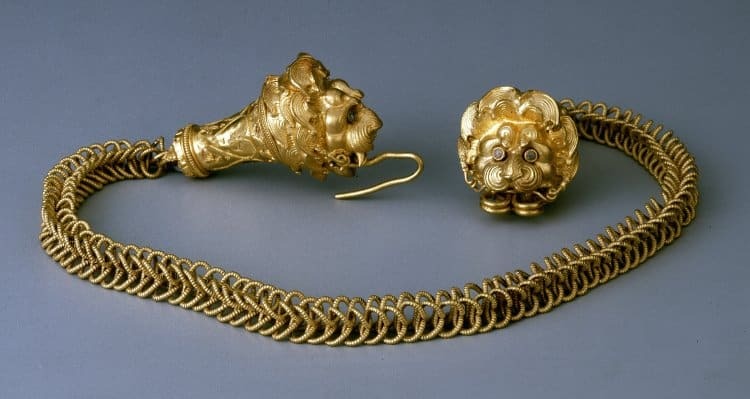 The jewelry extant from that period survived as a result of being buried with the owner, therefore, our knowledge is limited, but Celtic style torc necklaces seemed to have prevailed. The Byzantine era and Middle Ages present a unique problem for those who study the history of jewelry; the long-standing tradition of burying jewelry along with the deceased ended and with it went an invaluable source of information for the historian. We do know that much of the jewelry produced during that period was religious in nature. Opus interrasile, filigree and cloisonné enamel were popular techniques used to enhance the many designs made possible by the abundance of gold available. 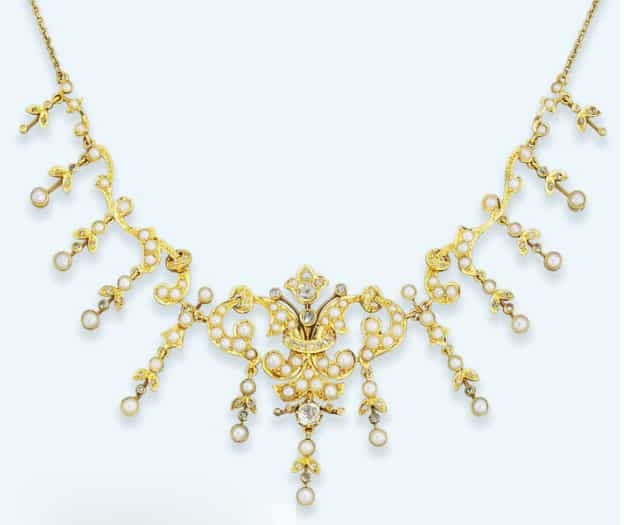 Intricate pendants, necklaces composed of openwork disks and medallions all mixed with beads and pearls formed the necklaces popular at the time. Niello and enamel replaced colored stone inlay for design accents and color. The poor economy and style of fashions drove jewelry in England and France out of favor during the 11th and 12th centuries. High collared, layered tunics left little room for decorative jewelry therefore spare, functional jewelry, brooches, buckles, and belts, prevailed. During the 13th century, it was illegal for commoners to wear gold, silver, and gemstones. 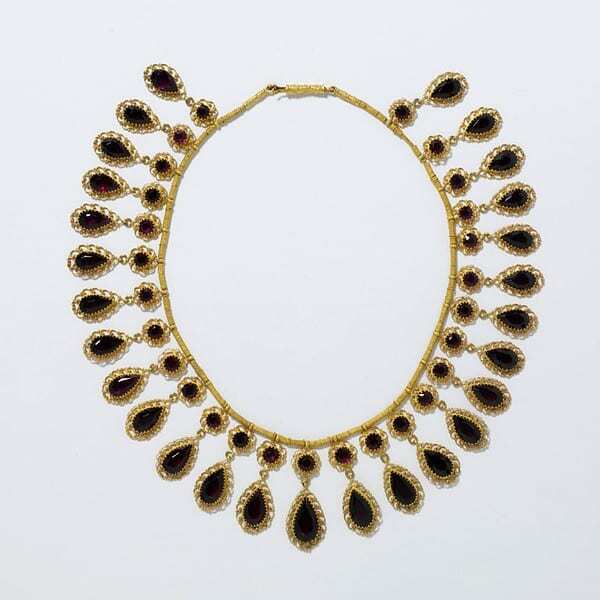 Royal jewelry from the period included cruciform pendant necklaces, rosaries, and elaborately decorated emblematic collars often suspending symbolic medallions. The Gothic era of the 14th and 15th centuries saw England following the French in passing a law forbidding commoners to adorn themselves with precious jewelry. Few necklaces from this era have survived and little information is available regarding their style or use. Innovation marked the 15th century with technically more sophisticated stone-cutting, en ronde bosse enameling and a sense of jewelry as a fashion item rather than simply an indicator of rank. Necklaces were predominant at the time due to the extreme decolletage being displayed. 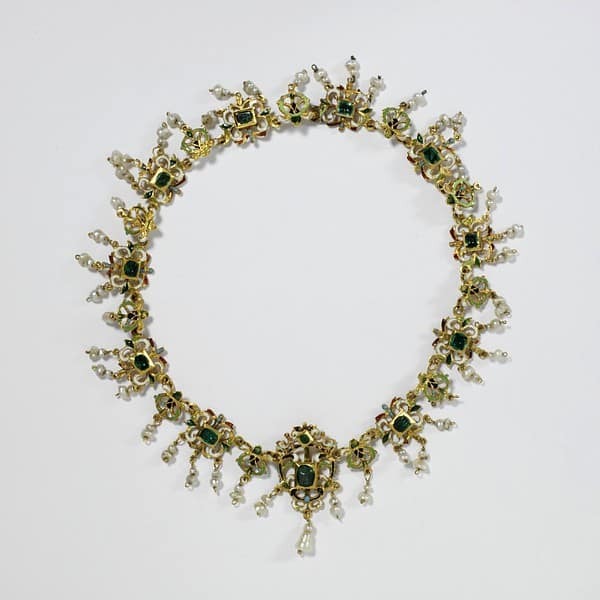 Secular jewelry included strands of pearls and gemstones, pendants and heavy, highly decorated collars. The more transcendent religious jewelry included elaborate reliquary pendants with incredible detail and intricately constructed locket compartments, cruciform pendants and ornate rosaries worn as necklaces. 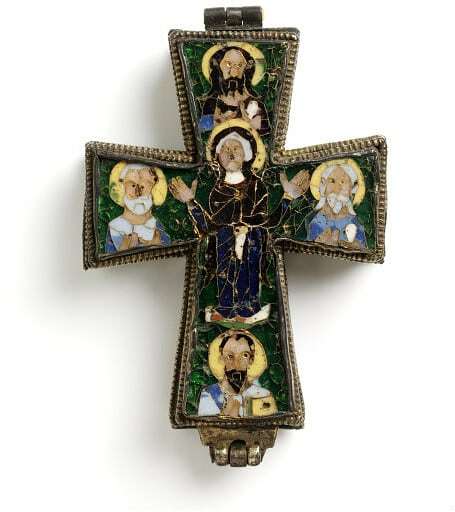 Beresford Hope Reliquary Cross Pendant In Gold, Silver Gilt and Enamel c.800-900. 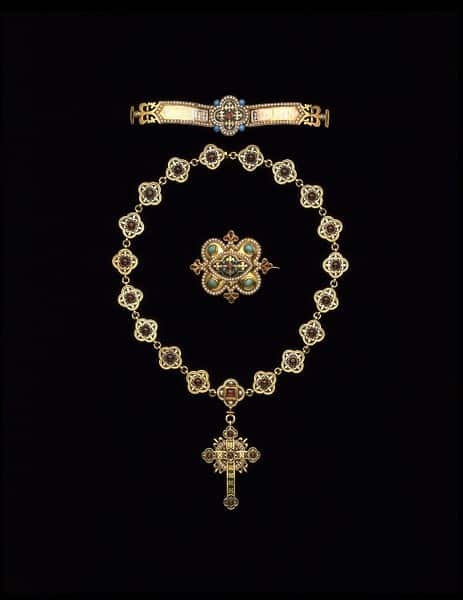 The Langdale Rosary Composed of Enameled Gold Beads c.1500. 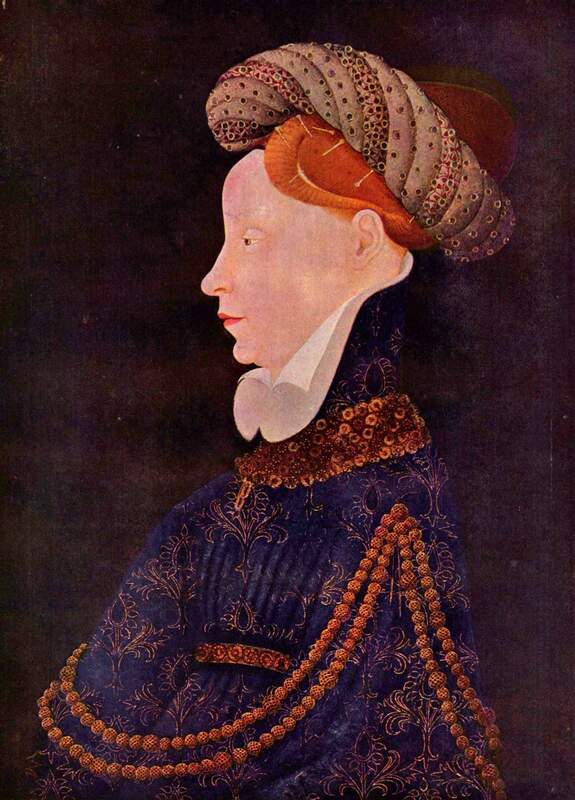 Porträt einer Dame by Franko-flämischer Meister c.1410. Higher necklines pushed necklaces up against the base of the neck. 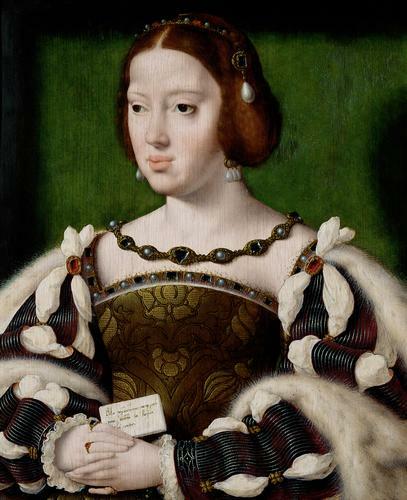 Portrait of Königin Eleonore von Frankreich (1498-1558) by Joos van Cleve c.1530. Long ribbons supporting a pendant functioned as necklaces. Necklaces were worn singly or in groups. 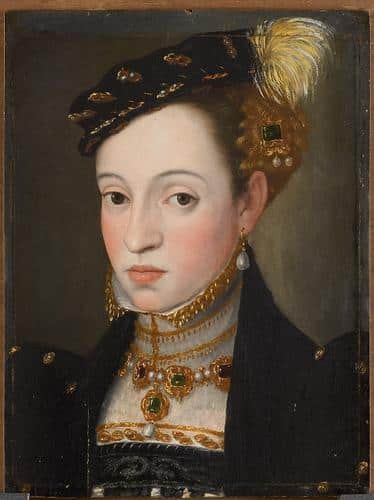 Deep décolletage in northern Europe kept necklaces popular. by Giuseppe Arcimboldo c. 1563. Later, high collars and ruffs necessitated long necklaces that could be worn over the clothing. Distribution of engraved printed designs created uniformity of style in the late 16th century. Delicate, openwork motifs with a central gemstone predominated. The Renaissance period brought about great advances in art and architecture that spilled over to the goldsmith‘s art. Medallions and pendants produced with this new level of sculptural artistry enhanced by enamel, baroque pearls, and carved gemstones were also created with a thematic emphasis on religion. Jewelers began to travel and circulate pattern books making it difficult to definitively pinpoint a particular goldsmith’s creations and causing prototypical designs to dominate. Repeated shapes, themes, and techniques appear throughout Europe. Delicate chains with and without pendants and chokers of pearls and beads were worn by women and heavier chains set with gemstones were favored by both men and women. Massive chains whose links were weighed individually were worn by men to serve as a way to transport their wealth with the “measured” links being readily available for use as currency. Later in the period, the theme for pendants and necklaces shifted away from enseigne medallions and religious iconography to mythological creatures. Women began to display more jewelry than men. Pearls had long been available in Europe but in the mid-16th century, due in large part to the extensive travel and trade by European explorers, they became available in much larger quantity than ever before. 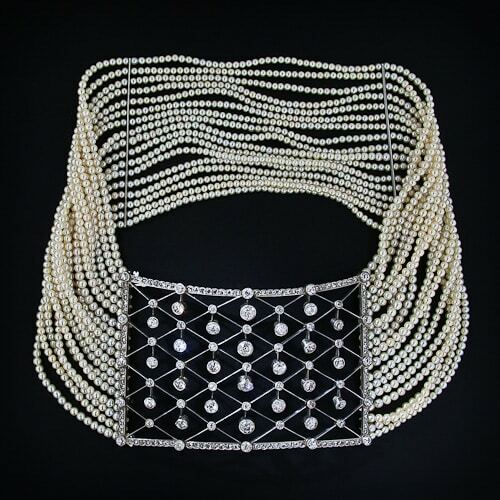 The result was a fashion for pearl necklaces of great length, sometimes wound around the neck several times or swagged and pinned in place across the bodice. The seventeenth century saw the development of technology that would enable gemstones to be faceted. Necklaces were constructed threading precious stones in their settings together with ribbon. This was the germination of the necklace known as the rivière. More elaborate necklaces featured a series of cluster pendants suspended from a chain or cord and tied around the neck. Memento mori jewelry with coffins, skulls, skeletons and other macabre themes made an appearance at this time. 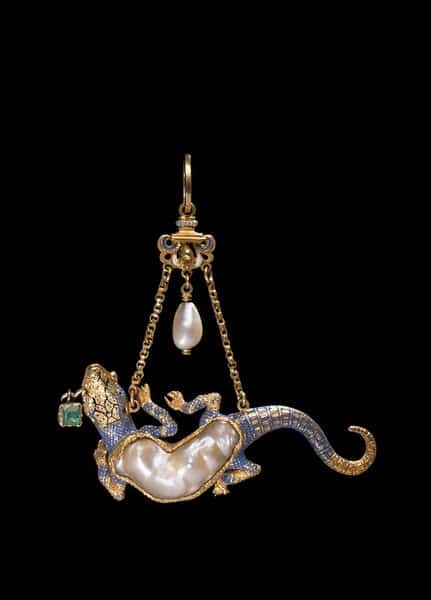 Enamel on Gold Salamander Pendant with Baroque Pearl Body c. Late 16th Century. 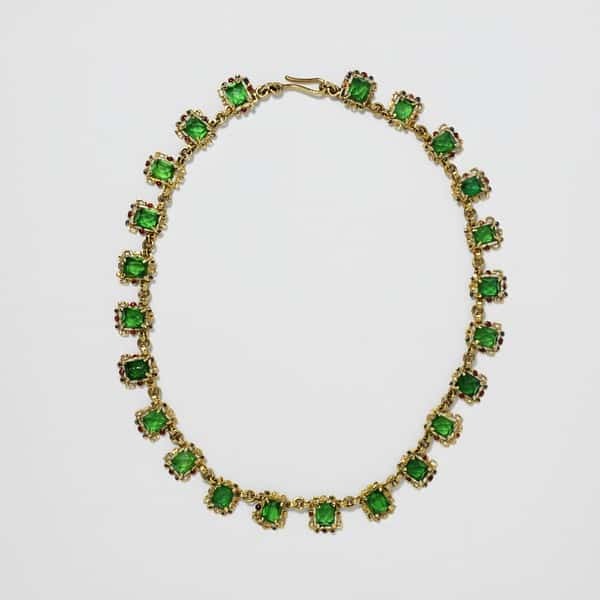 Seventeenth Century Spanish Gold, Enamel and Green Glass Necklace. Italian Gold, Enamel, Emerald and Pearl Necklace c.1620, Sicily. 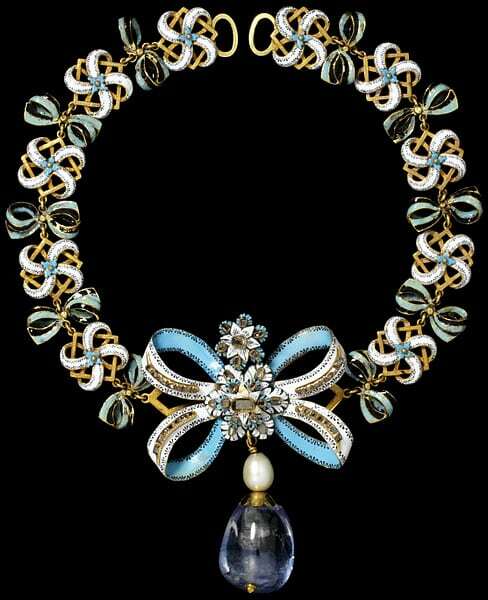 Bow Necklace, Enamel, Table-Cut Diamonds, Pearls and Sapphires. More widespread use of faceted gemstones becoming the focus of the piece. Linear necklaces with closed collets. Most important were pearl necklaces. Enamel, Table-Cut Crystal and Pearl Necklace. c.1600, Italy. 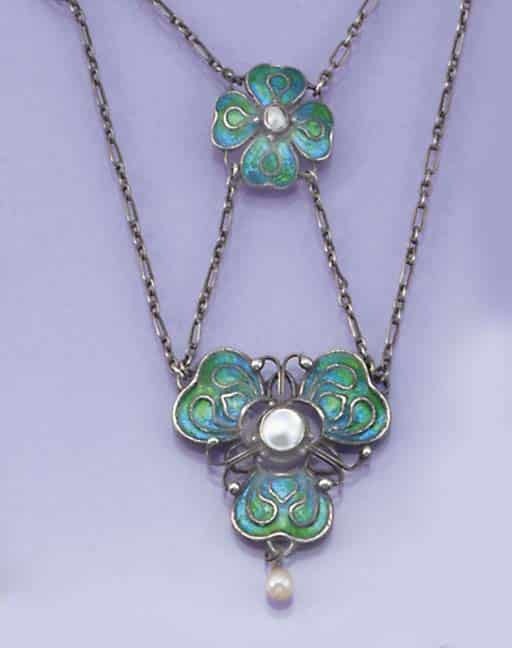 Enamel Floral Necklace, Table-Cut Emeralds and Pearls. 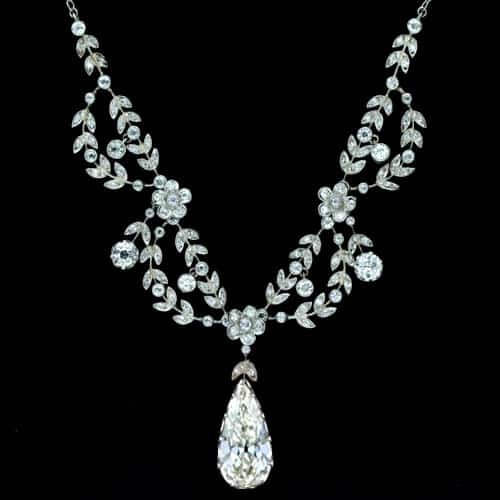 Diamonds were the premier gem of the first half of the eighteenth century. This fascination with diamonds arose from the newly developed ability to facet them thereby more efficiently reflecting and refracting light. Diamonds were more brilliant than ever before. Daytime diamond wear was now permissible, but the more extravagant jewels were still reserved for evening and candlelight. Diamonds were set in silver with closed backs until mid-century when open back settings came on the scene. Flowers and bows were the prevalent theme and parures were all the rage with a magnificent necklace as the centerpiece. Cameos were employed in jewelry making at unprecedented levels. They could be found in tiaras, necklaces, brooches, bracelets, rings, virtually every type of jewelry and accessoire imaginable. During the latter half of the eighteenth century, colored stones came back into style. 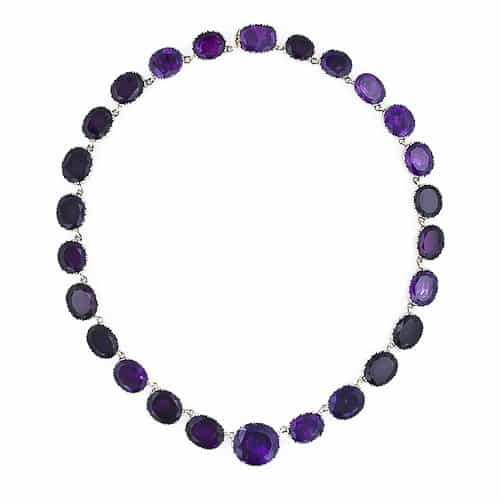 Rivières linked together long lines of individually set stones, sometimes diamonds, but often colored stones. The popularity of the rivière has never been seriously challenged; a classic on into the twenty-first century. White Topaz Set in Silver, Portugal c.1780-1800. Deep décolleté, short necklaces worn tightly around the neck. Wide gem-set bands, sometimes with a bow or cross pendant. En Esclavage – openwork band suspending festoons and pedants. Pendants were detachable for versatility. Necklaces were tied in elaborate bows at the back by ribbons run through looped terminals. The use of ribbons made necklace lengths variable/adjustable. Rivière – line of gemstones (usually graduated) in plain collets. Sometimes suspending a large diamond pendant. Daytime necklaces were less precious, nighttime was reserved for diamonds. Silver mounts with closed backs for diamonds and gold mounts for colored gems. Foil lining provided uniform coloring for gemstones. Gold backings for silver necklaces to prevent tarnish on skin. Metal spring ring clasps began to replace ribbons for closures. An interesting development c.1804 was the manufacture of Berlin ironwork jewelry. First produced at the Royal Prussian Foundry, black enameled pieces with geometric wire patterns were created. These works quickly morphed into the neo-classical style that was so popular throughout Europe. 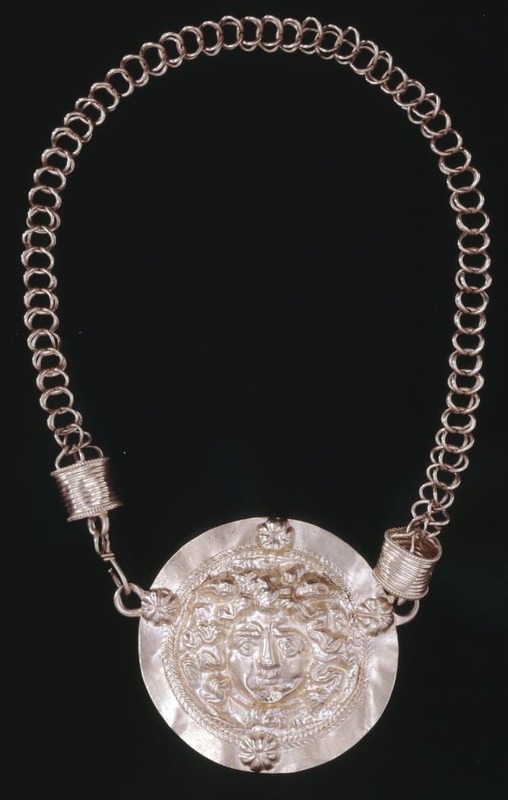 Necklaces featuring repoussé medallions depicting classical scenes were suspended or interspaced by fine chainwork. Napoleon captured Berlin and confiscated the molds making it extremely difficult to determine the origin of ironwork – French or German? The Germans used the iron jewelry to turn the tables on Napoleon by donating their jewels in exchange for iron jewelry to fund their fight for independence. The public had a love affair with the delicate iron tracery and the the material remained in use throughout a switch to realistic design and a revival of Gothic themes. The fall of Napoleon led to relative poverty in France resulting in a brief period were the style was no jewelry at all. When French jewelers finally went back to work diamonds were out of favor as modestly priced colored stones were preferred. Cannetille parures set with colored stones in realistic floral motifs were all the rage. The archaeological discoveries throughout the world would fuel a European wide style that referenced ancient civilizations alongside the fashion for more romantic jewels in the Renaissance and Gothic styles. 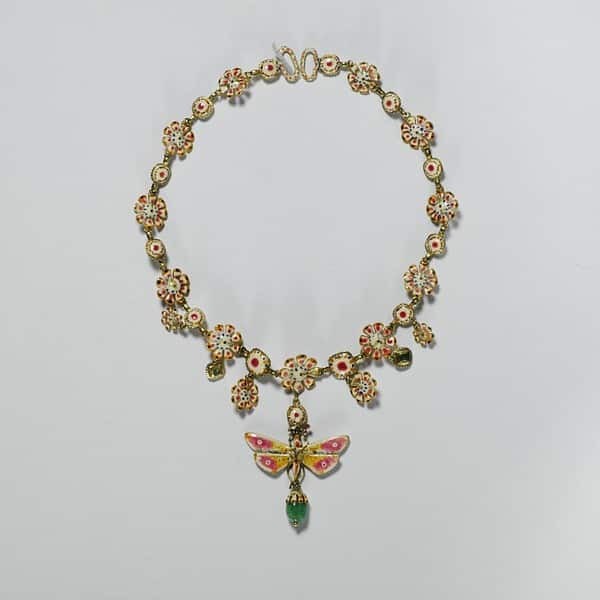 Necklaces featured micro-mosaic and pietra dura plaques connected by chainwork, whole suites of cameos, beautiful bead and wirework designs and fabulous enameled pendants in the Renaissance style. 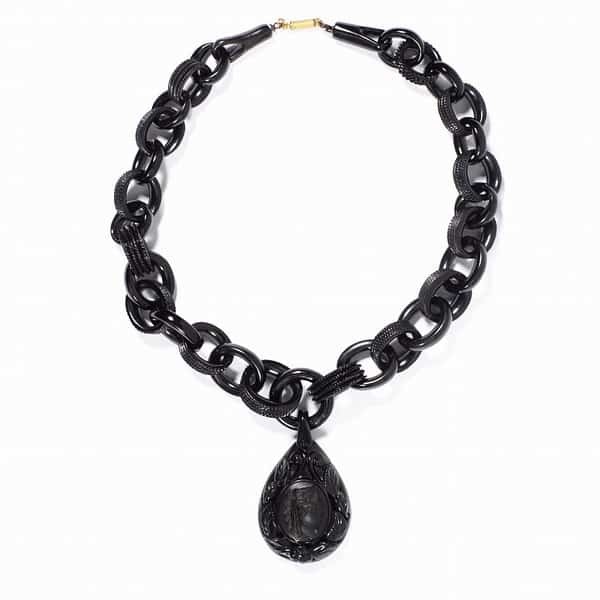 Mourning jewelry items included pendants and neckchains carved from Whitby jet, and woven from human hair. Sentimental lockets and medallions proclaiming “Forget Me Not” were suspended from chains. New methods for mass producing fashion jewelry were being developed in England. Electro-plating, faux gemstones, stamping, and other techniques created jewelry at a faster pace and for more consumers than at any time in history. Silver discoveries made this metal more available and affordable and millions of silver jewelry items were produced quickly as a result of the mass production capabilities in England. 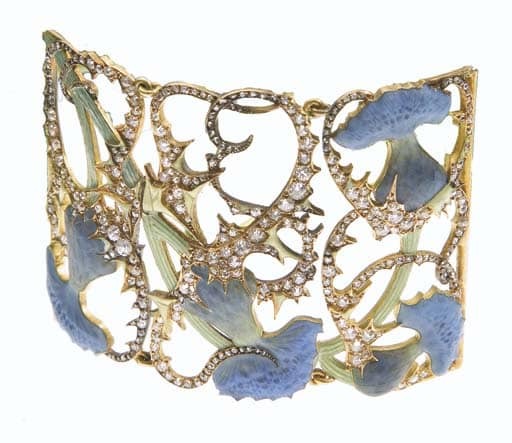 A backlash to the overproduced poorly stamped jewelry in the latter half of the nineteenth century resulted in a new aesthetic and philosophy seeking to revive the crafts, Art Nouveau. 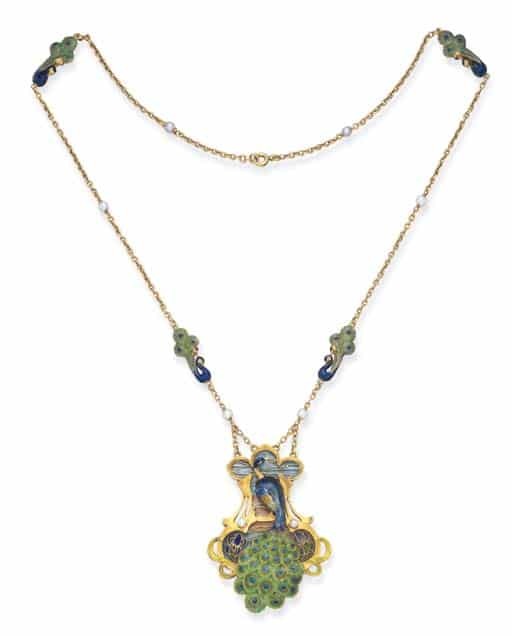 The free-flowing “whiplash” designs of Art Nouveau were employed in making incredible pendants and necklaces decorated by a veritable rainbow of colorful enamels, employing various enamel techniques including plique-a-jour and all manner of interesting if not valuable gems. Themes from nature especially flowers, insects, and birds as well as fantastic mythological creatures and female figures combined with a multitude of creatures are the signature designs of the period. 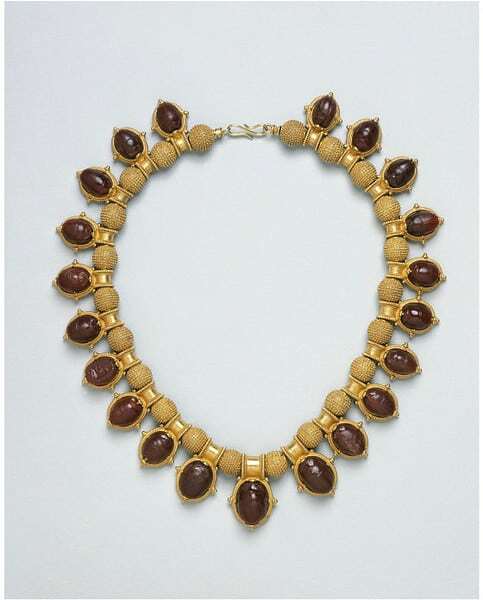 Castellani Gold and Carved Carnelian Scarab Necklace. 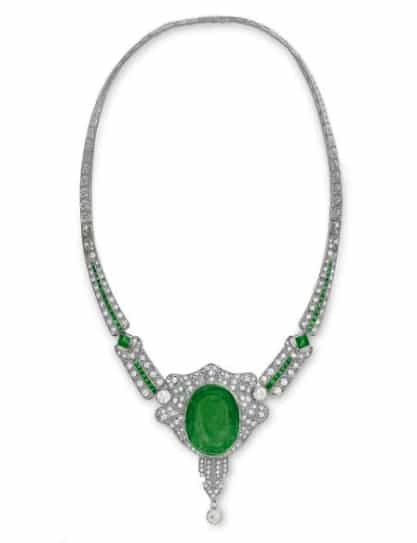 Emerald and Diamond Necklace Attributed to Nitot. c.1806. 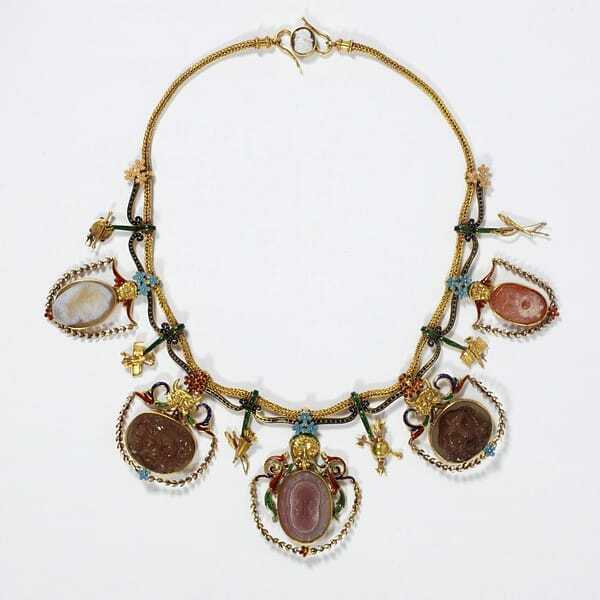 French Pietra Dura Necklace en Esclavage. c.1810. 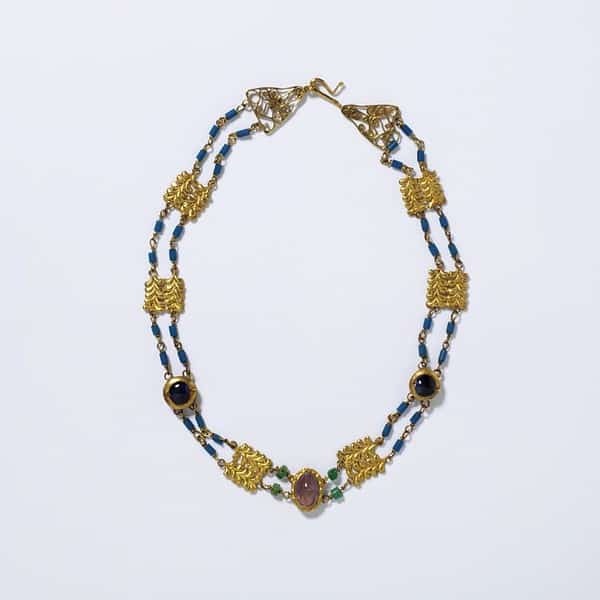 Italian Micromosaic Necklace en Esclavage. c.1810. Lighter, flatter more linear necklaces. Broad use of cameos and intaglios. Rivières were still popular now connected by links instead of ribbon. Clusters of stones with a central motif linked by fine gold chains to matching graduating smaller motifs. Long necklaces draped sash-like over one shoulder diagonally across the body. Semi-precious daywear gems, precious in the evening. 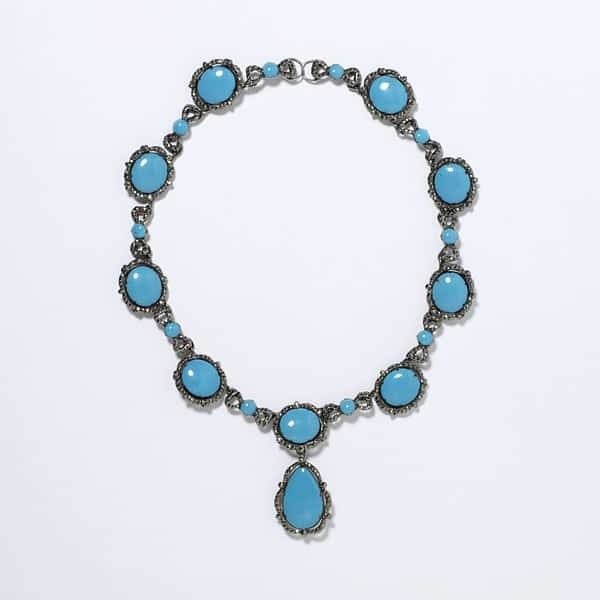 Turquoise and Pearl Necklace c.1820. Décolleté became a straight across and off the shoulder. For day wear a ruff or collar was added for modesty. Floral Seed Pearl Motif Necklace. c.1820. Necklaces were shorter with large girandole, pendeloque and cross motif detachable pendants. Colorful foiled gems mounted in cannetille. 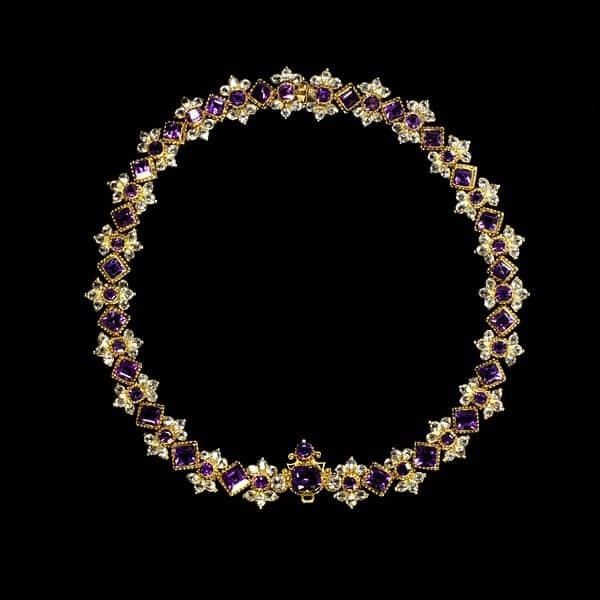 Amethyst and Gilt Cannetille Necklace. c.1800-1850. 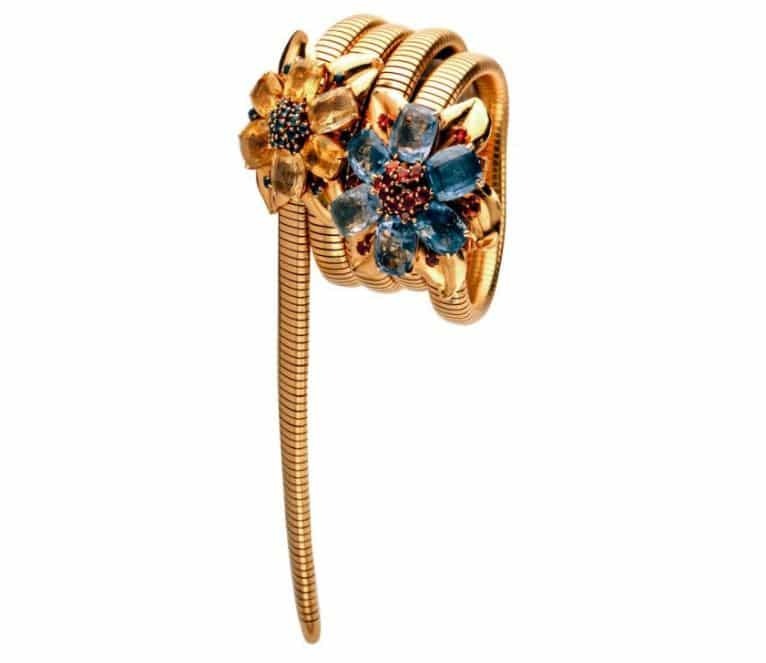 Repoussé decorative elements with colored gemstones. Polychrome enamel designs often used instead of gemstones. Parures were a fashion necessity. 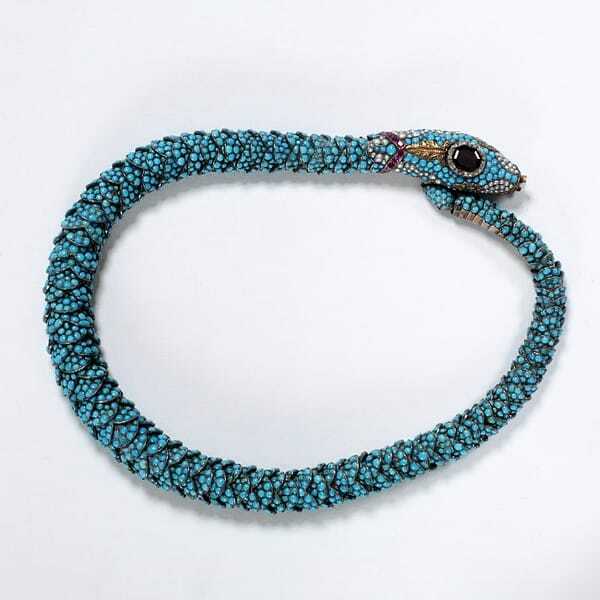 Turquoise Encrusted Snake Necklace. c. 1835-40. 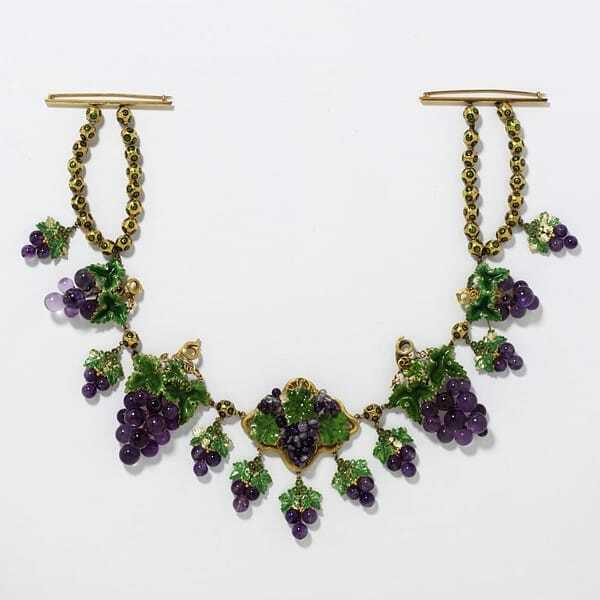 Amethyst and Enamel on Gold Grape Cluster Necklace, c.1850. Daywear concealed nearly all of a woman’s body. Nighttime straight across décolleté was still in vogue. Large bodice ornaments nearly replaced necklaces altogether. Short necklaces were worn at the base of the neck with naturalistic designs: fruit, flowers and serpents. 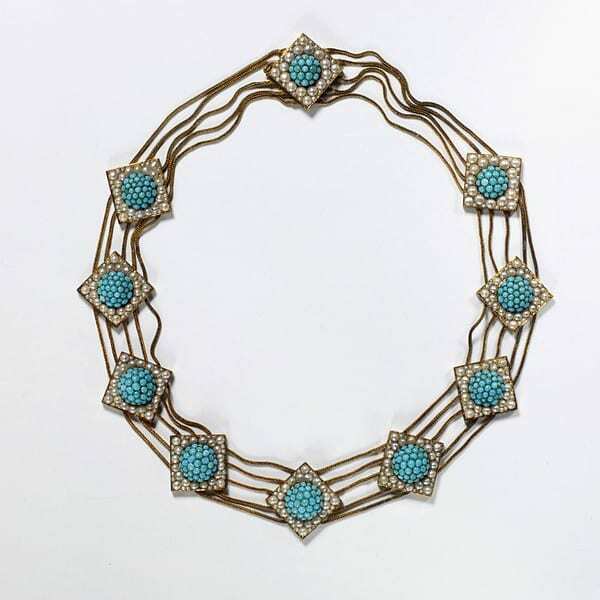 Pearl and Turquoise Necklace c.1860. 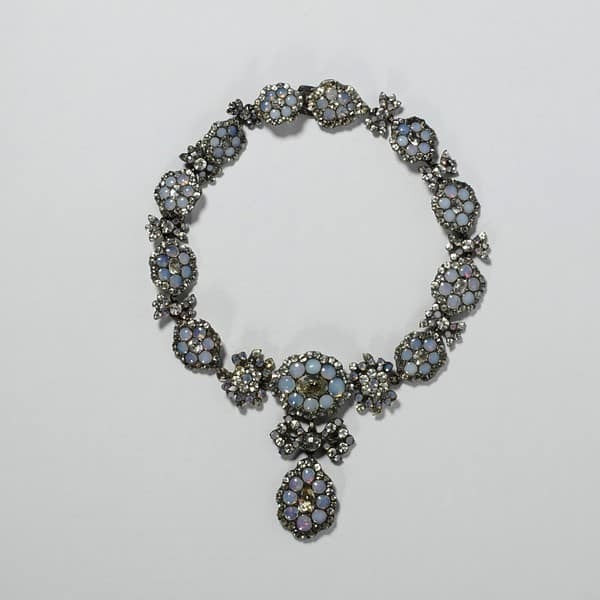 Tiffany & Co. Japonesque Necklace c. 1880. Necklaces were popular again and for evening wear the décolleté was very deep. Souvenier jewelry included mounted hummingbird heads, teeth, animal claws, shells, tortoise shell pique, micromosaics, carved cameos and lava jewelry. 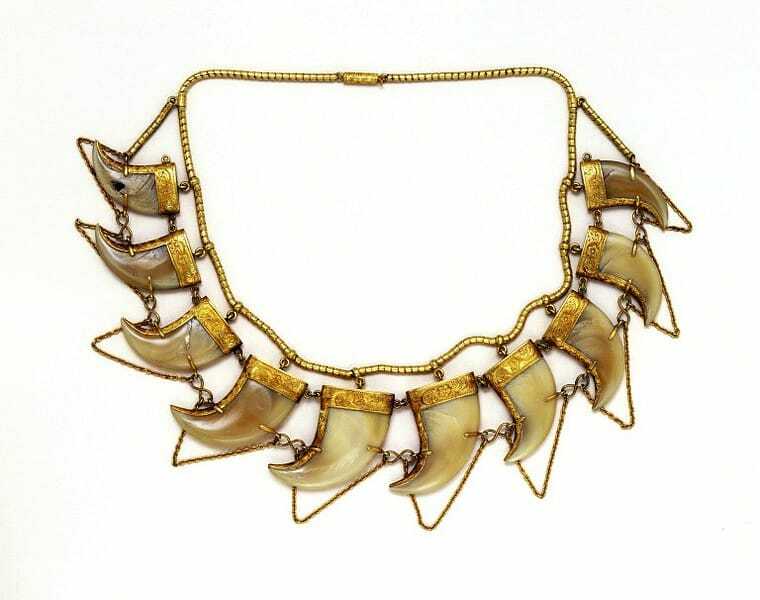 Tiger Claw and Gold Necklace c.1865. 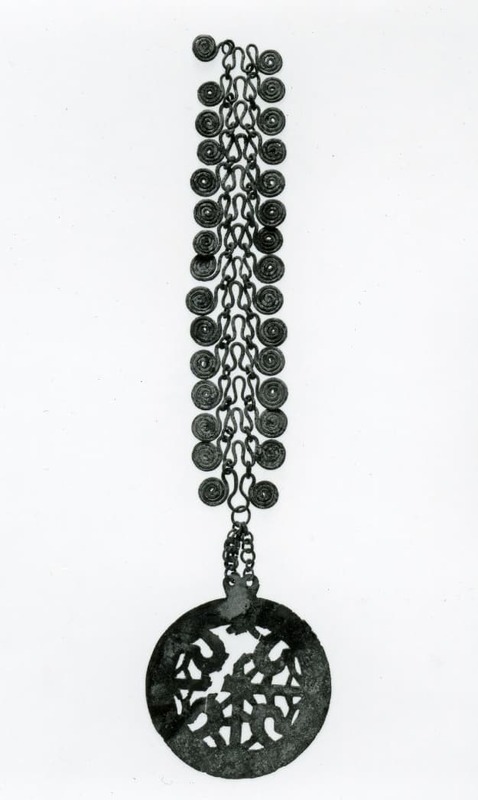 Carved Jet Mourning Necklace c.1870. 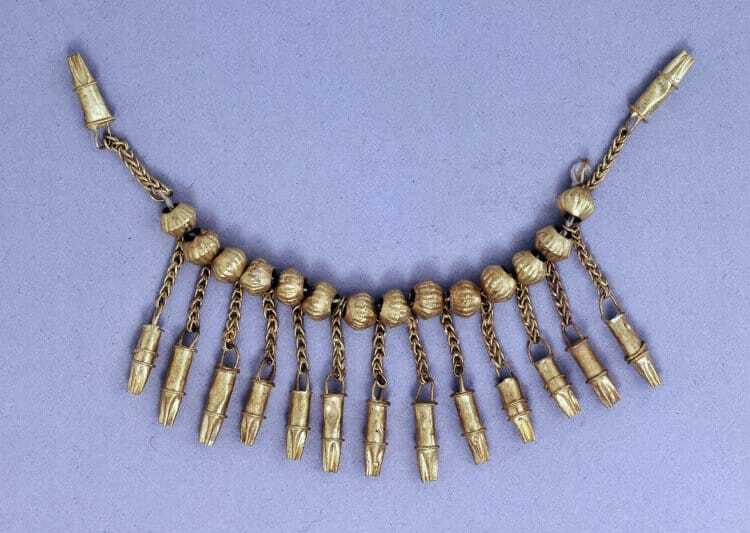 Archeological styles, with ancient techniques, were used to design short necklaces, with a chain or a band foundation, suspended numerous pendants all around, usually in a fringe. Cameo Necklace, John Brogden c.1867. 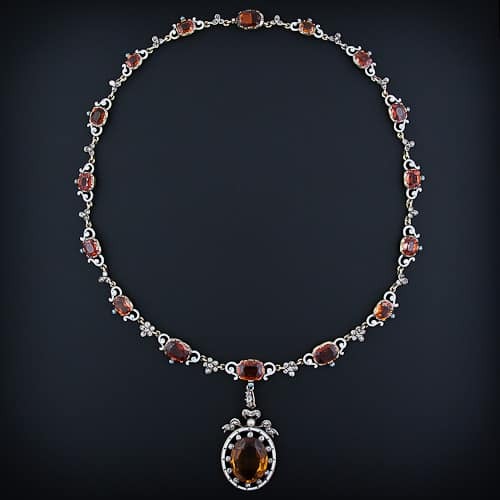 Renaissance Revival Citrine and Hessonite Garnet Diamond and Enamel Necklace. Renaissance and Gothic revival styles with elements from architecture and sculpture were combined with symbolism and heraldry and decorated with polychrome enamels. 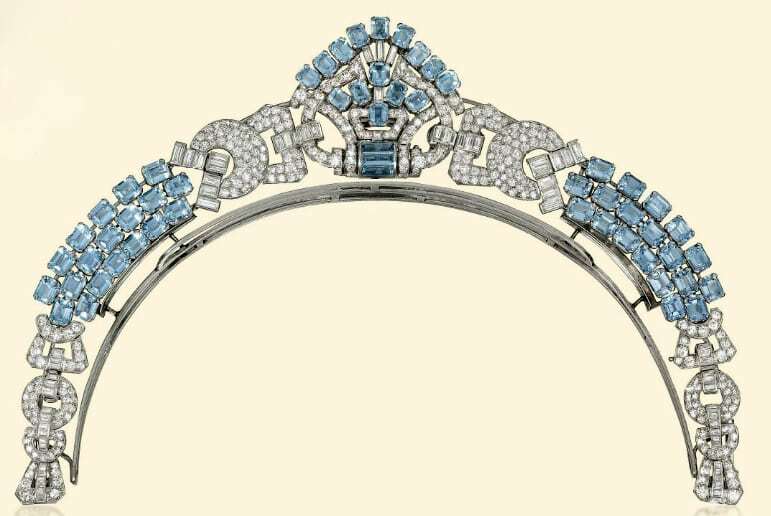 Late Victorian Cushion-Cut Diamond Rivière, Converts to Bracelets. 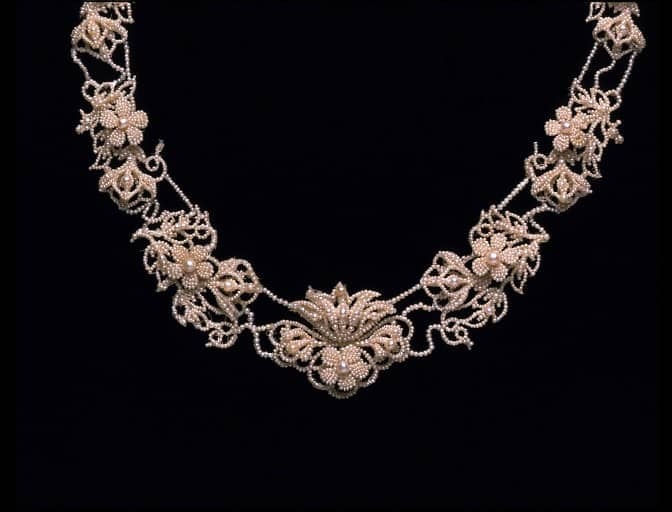 Late Victorian Diamond and Half Pearl Fringe Necklace. 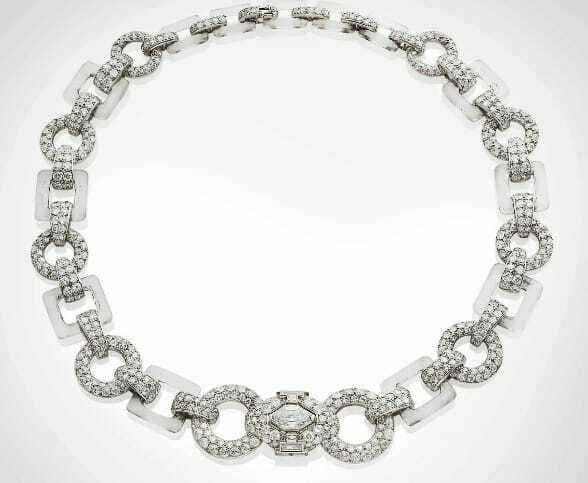 A Pair of Diamond and Platinum Résille Collars by Cartier. Diamonds discovered in South Africa provided ample stones to make magnificent creations with emphasis on intrinsic value over design. Rivières were extremely popular and were made of large fine quality diamonds, mounted in open collets with a gallery. Often convertible to bracelets and other items. The bust, underscored by an uplifting corset, became the focal point of feminine fashion. Covered to the neck in the daytime and displaying a deep décolleté in the evening. 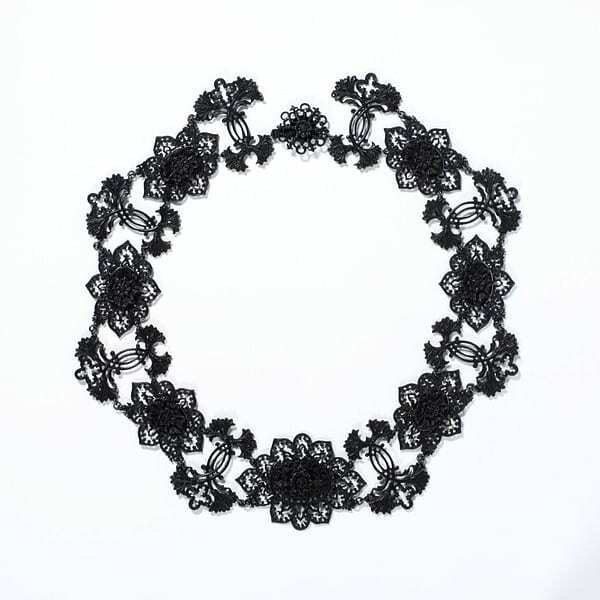 Choker: Very wide and snuggly fitted to the individual neck. 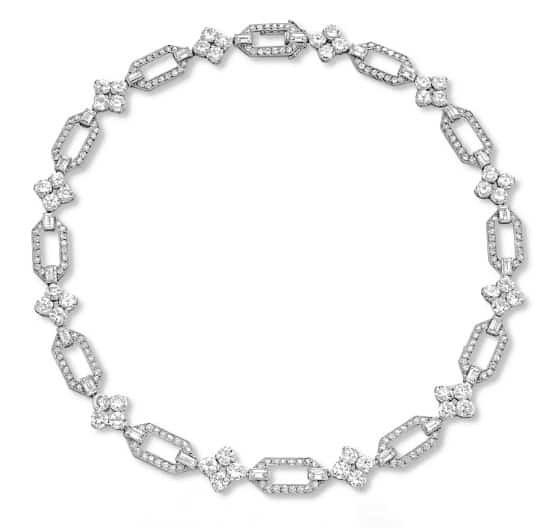 Résille: necklaces of finely netted meshwork set with diamonds. Collier de Chien: Wide with a plaque on a ribbon or multiple rows of pearls. Continuous lines of articulate plaques. 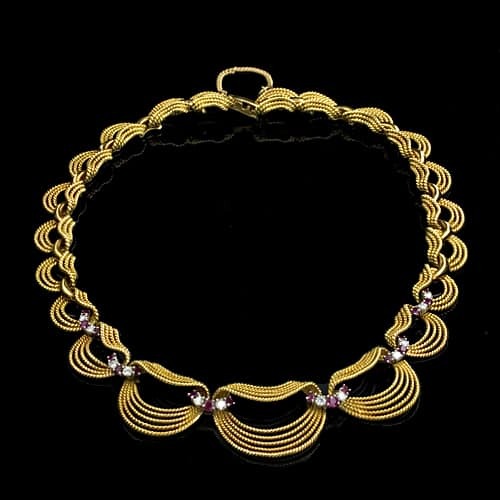 Fringe necklace: At the base of the neck (below the choker) designed as a series of pendants suspended like fringe and usually could double as a tiara with the addition of a framework. 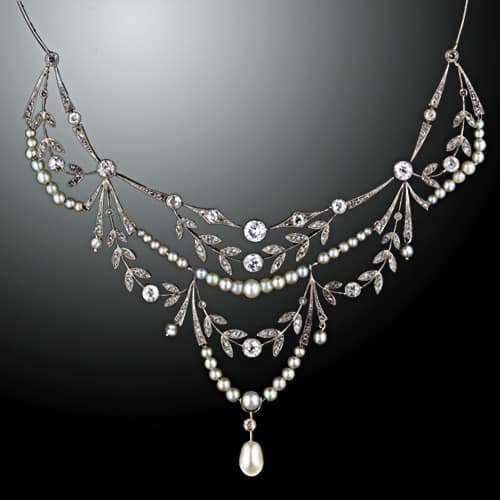 Chaumet Diamond and Pearl Collier de Chien, c.1905. At the turn of the twentieth century, newly delicate styling was made possible by the use of platinum in combination with diamonds. Evolving alongside Art Nouveau this new aesthetic became known as Edwardian (or Belle Epoque in France). Pendants of incredible detail and airiness suspended from equally fine chains were in vogue. Chokers and colliers de chien were often combined with sautoirs and longchains. Incredible, intricate, garland design necklaces completely encrusted with diamonds glimmered under the electric lights of evening. As World War I ramped up, Art Nouveau fell out of favor and, at the conclusion of the war, Edwardian was gone as well. Once the dust cleared, a demand for a more ostentatious style of jewelry arose. Combining this new demand with the popular Cubist movement in the arts resulted in the distinctive geometric jewelry we call Art Deco. 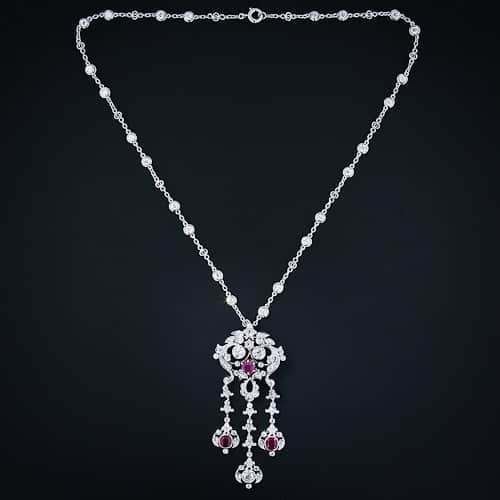 Necklaces were made of platinum and decorated by round brilliant and emerald-cut diamonds with colored stones providing contrast, often calibré-cut to create delicate outlines. 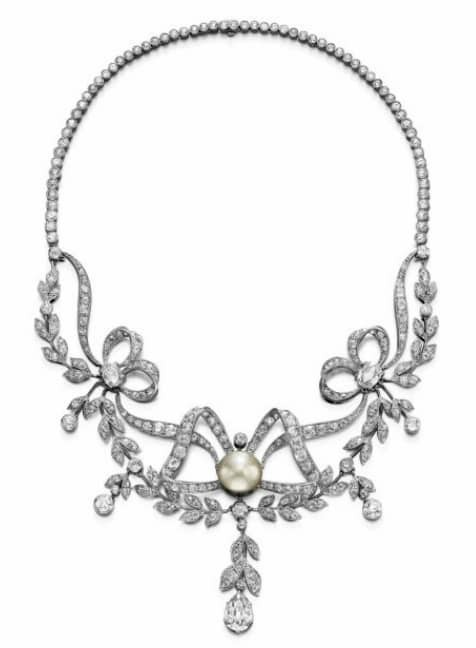 Long sautoirs, infinite strands of pearls and négligées adorned the neck and provided elongated decoration on the new dropped waist straight silhouette. The retro period saw the return to the use of gold in jewelry. 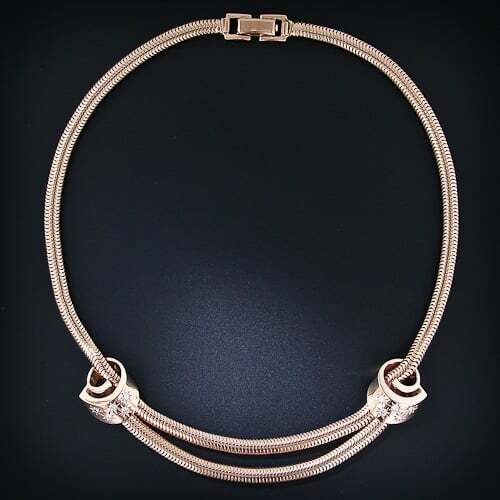 Bold highly polished mechanical links in rose, yellow and green gold made distinctive collars encircling the neck. 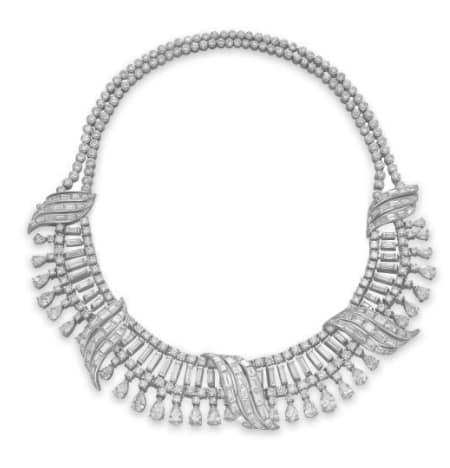 Post World War II once again saw platinum come into vogue. 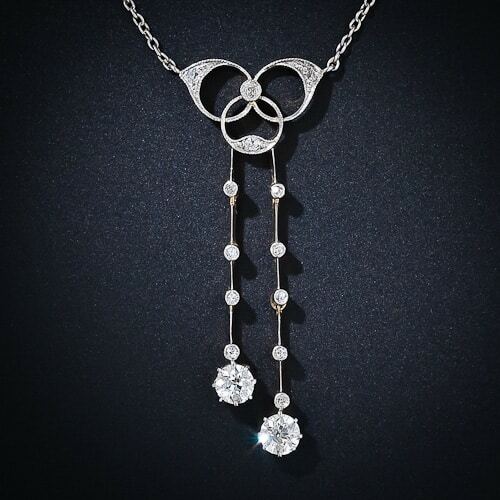 The rivière was restyled to include new diamond shapes such as the pear and marquise. 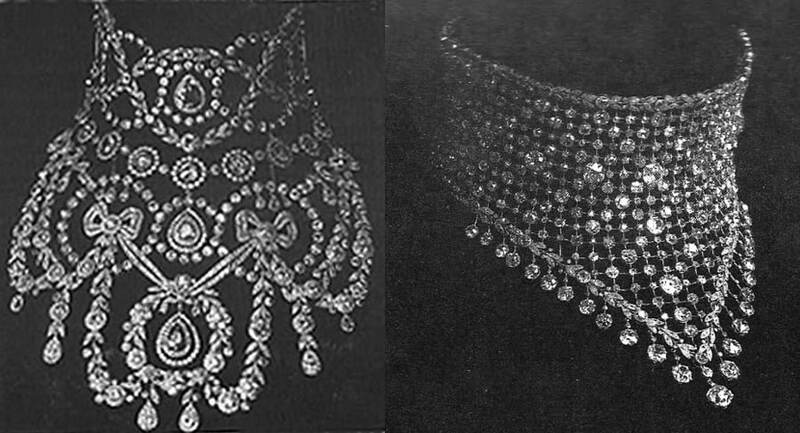 These chokers were often set all around with diamonds and suspended diamond or pearl pendants. Pearl necklaces were another favorite during this period and they were most often composed of double strands of graduated pearls. Bead necklaces in all types of gem material were considered appropriate for day wear. 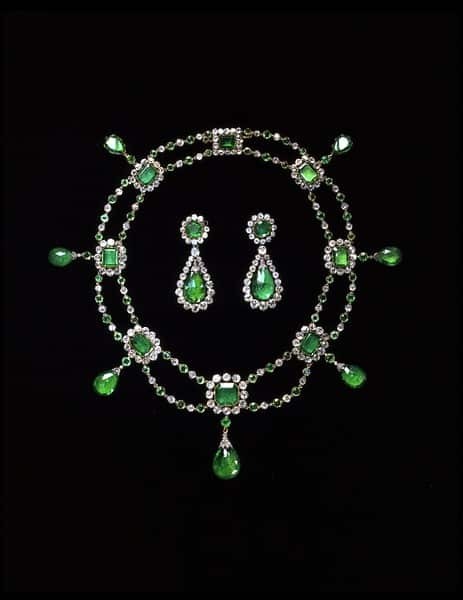 Gone was the parure but matching necklace and earring suites had stepped in to take their place. 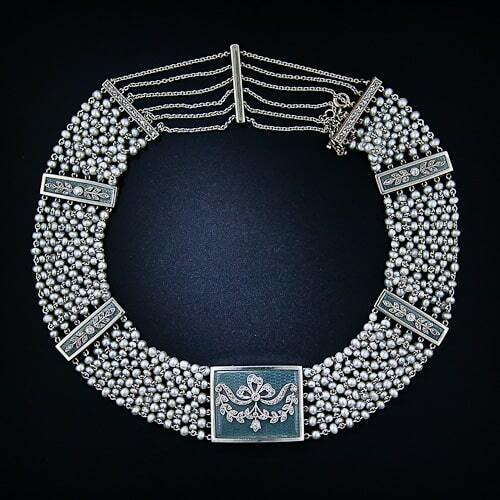 Belle Epoque Diamond and Pearl Necklace c.1910. Edwardian Pearl, Enamel and Diamond Bow and Foliate Motif Choker. “S” curve silhouette with prominent bustline and deep décolleté. Often more than one necklace at a time was worn: Collier de chien, Lavallière, Négligée, Scalloped/swag necklaces, and Rivières. 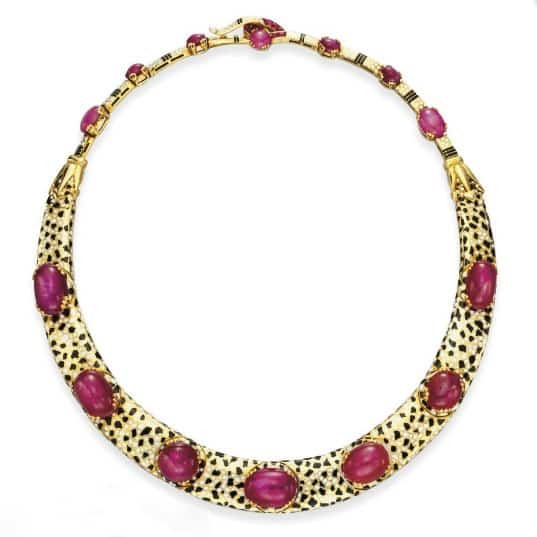 Edwardian Diamond and Ruby Lavallière. 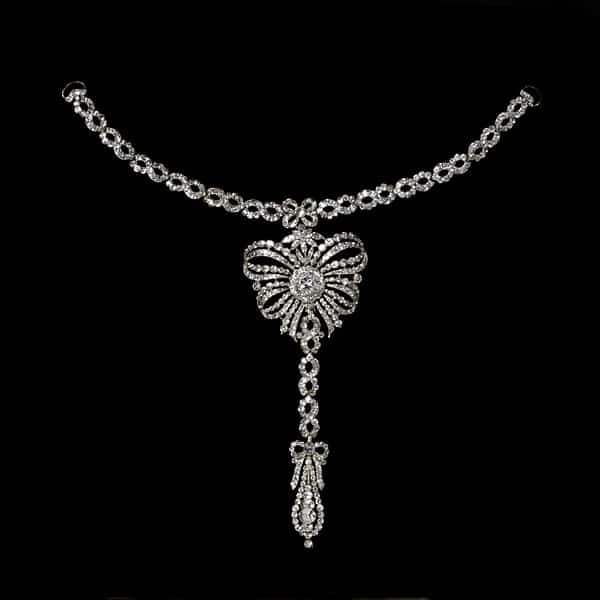 Belle Epoque Floral and Foliate Motif Diamond Necklace. Edwardian Diamond Plaque de Cou, c.1900. Sautoirs complimented the new straight shift dress designs c.1910. 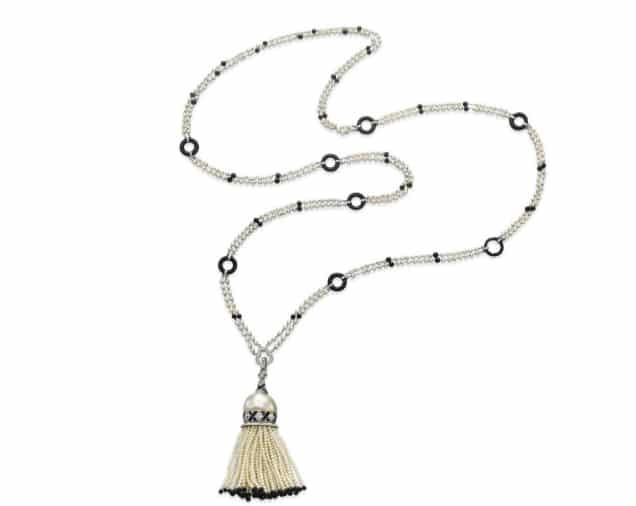 Ropes or bands of seed pearls with tassels or pendants. 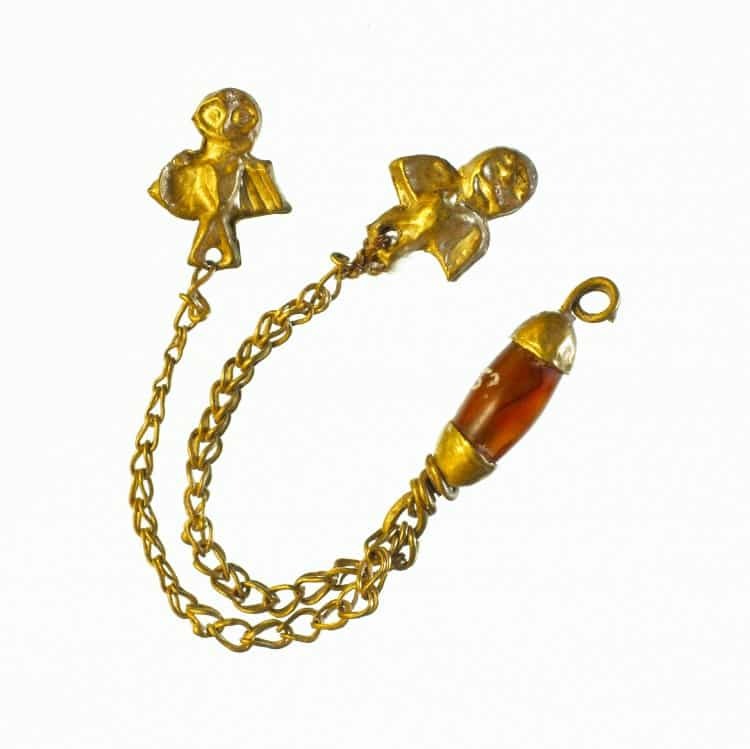 Often with detachable pendants and could be worn short or long or converted to bracelets. Plaque with pearls or ribbon. Black velvet ribbon with lacy diamond applique. Band of pearls or pale gemstones. Long strands of pearls worn in multiples. 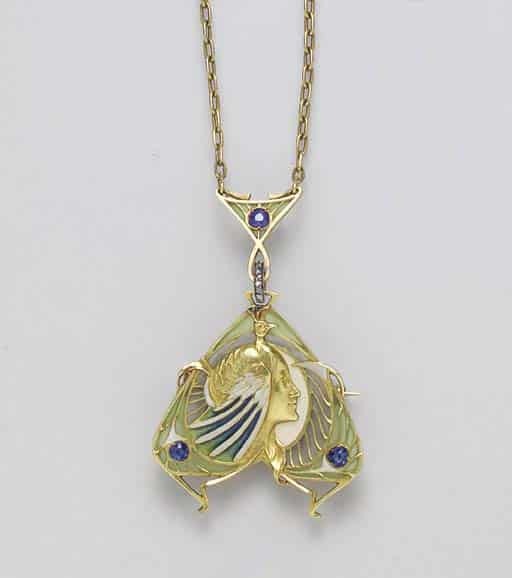 Art Nouveau Enamel Peacock Necklace. Birds, flowers, animals and the feminine form. Design more important that intrinsic value. 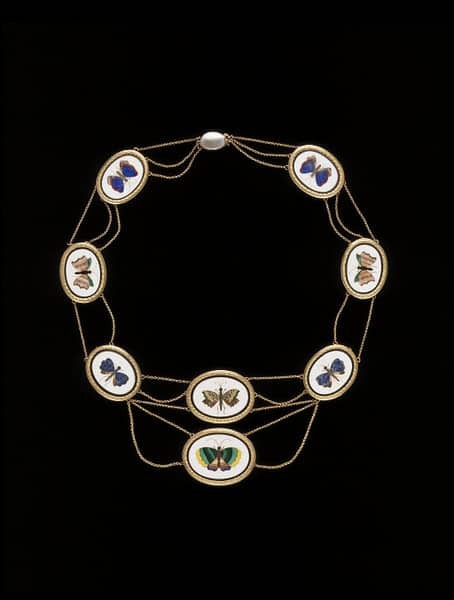 Arts & Crafts Enamel and Sterling Silver Necklace, Horner. Lalique Enamel and Diamond Thistle Motif Plaque de Cou. 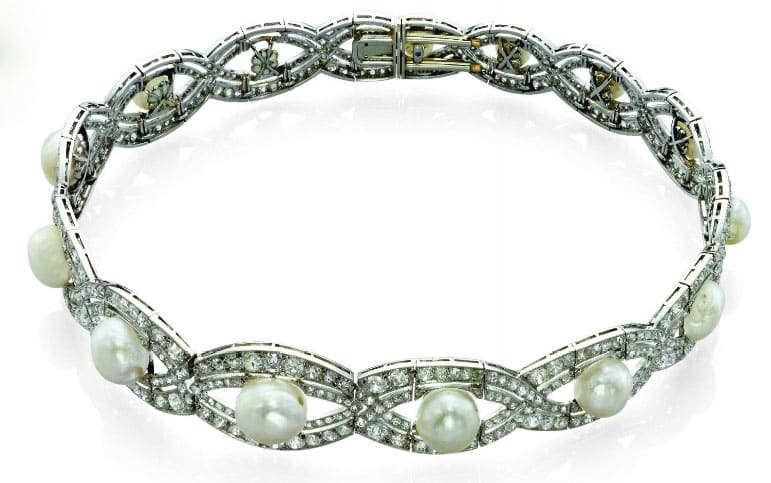 Central enamel and gem-set plaque on multi-strand pearl choker. Lavallière and en esclavage designs dominated. 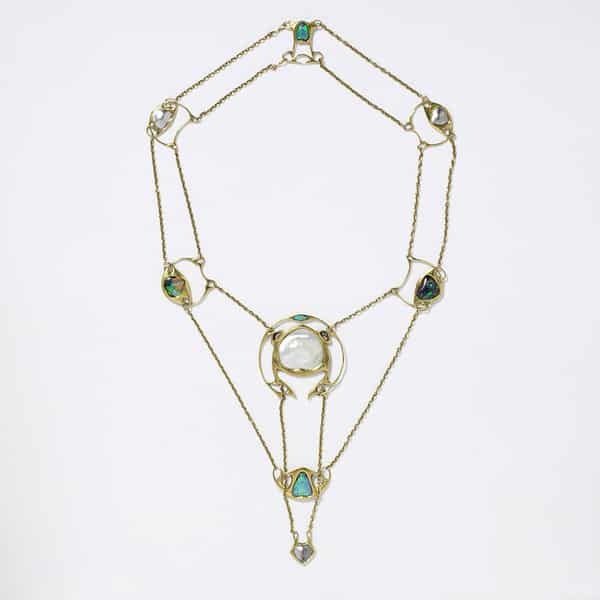 Pearl and Opal Necklace, Knox c.1902. 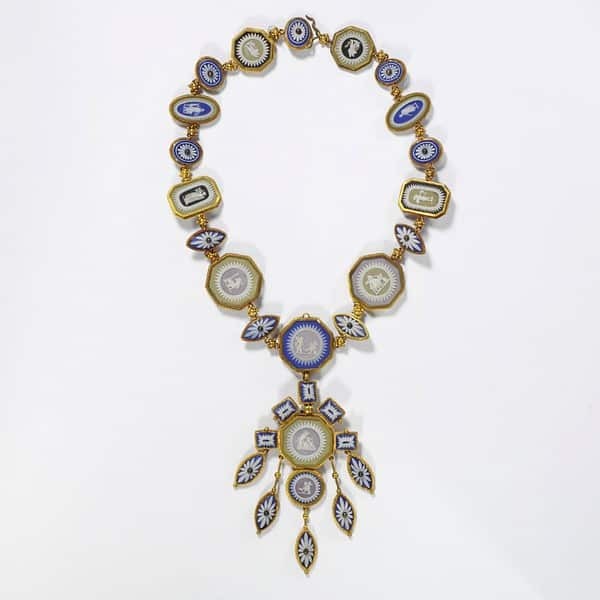 Lucien Gautrait Enamel and Sapphire Feminine Profile and Peacock Pendant Necklace, c.1900. Materials selected to compliment the design. Opals, moonstones, pearls and other pale gems preferred. 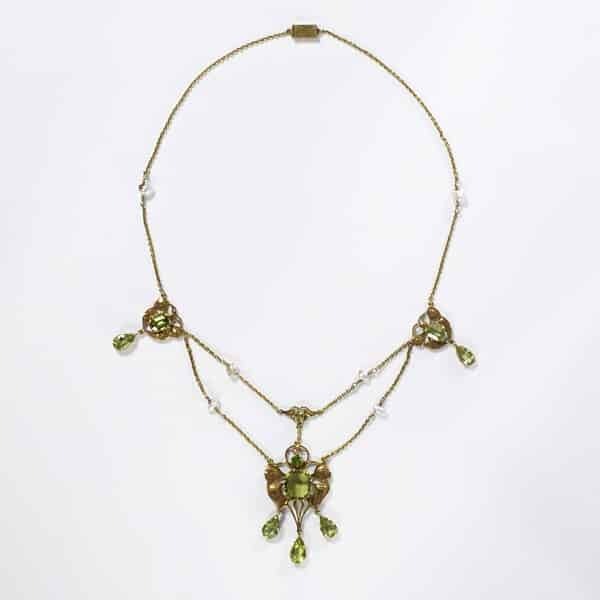 Art Deco French Emerald and Diamond Fringe Necklace, c.1925. Cartier Art Deco Pearl and Onyx Sautoir, c.1925. 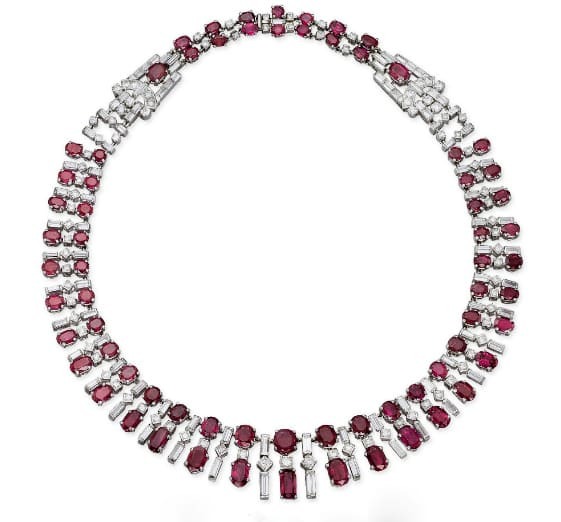 Art Deco Burma Ruby and Diamond Necklace, c.1930. 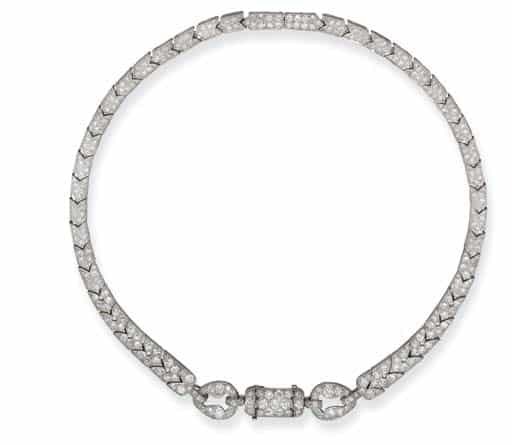 Art Deco Diamond Collar, c.1930. Strait shifts, short skirts, masculine hair styles all remained in vogue after the war. Sautoirs with long lines swinging freely – very geometric, and convertible. Egyptian, Oriental and Indian motifs. Bold gemstone combinations, vivid colors with extreme contrasts. Rock Crystal and Black Onyx. Emeralds, Rubies and Sapphires together. New diamond cuts/shapes and calibré-cut gemstone combinations. 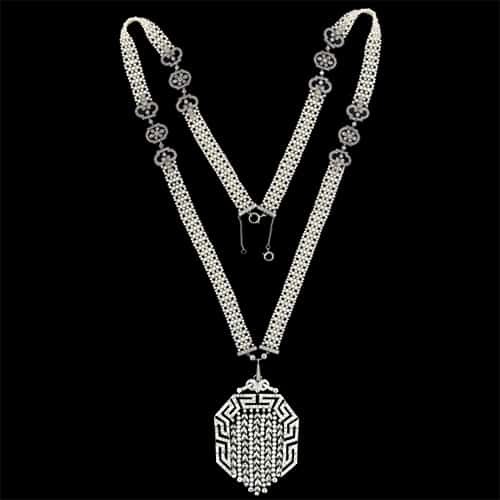 Art Deco Diamond Pendant Necklace, c.1925. 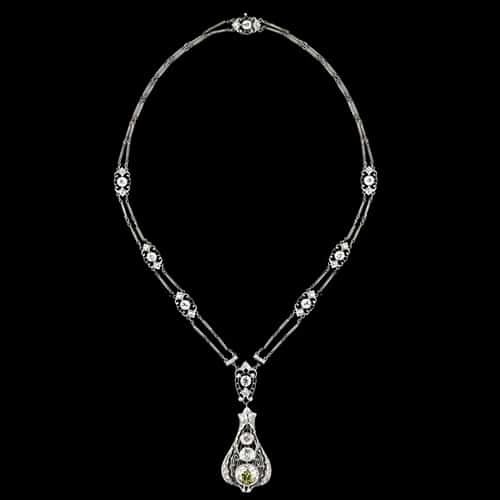 Cartier Art Deco Rock Crystal, Onyx and Diamond Necklace, c.1930. 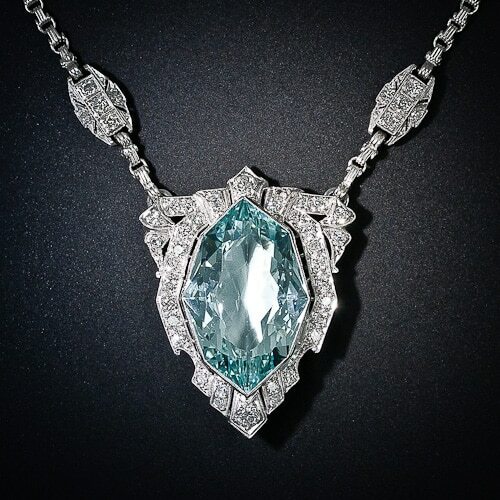 Art Deco Aquamarine and Diamond Pendant Necklace. 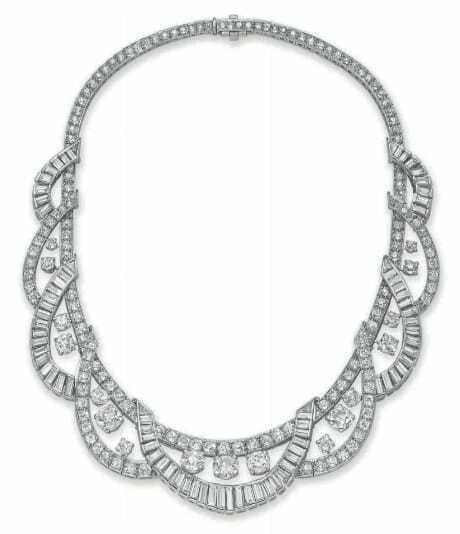 Cartier Art Deco Diamond Necklace, c.1925. 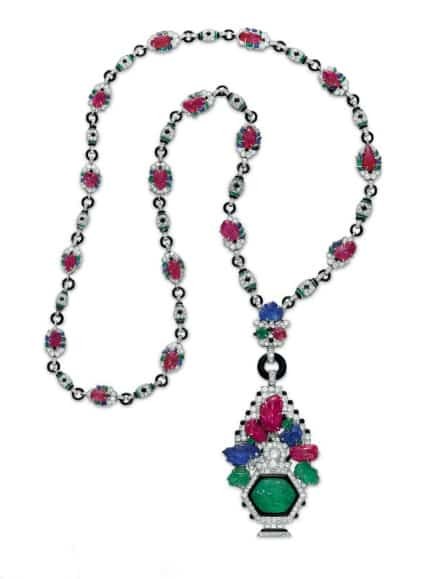 Mauboussin Tutti Frutti Sautior, c.1927. 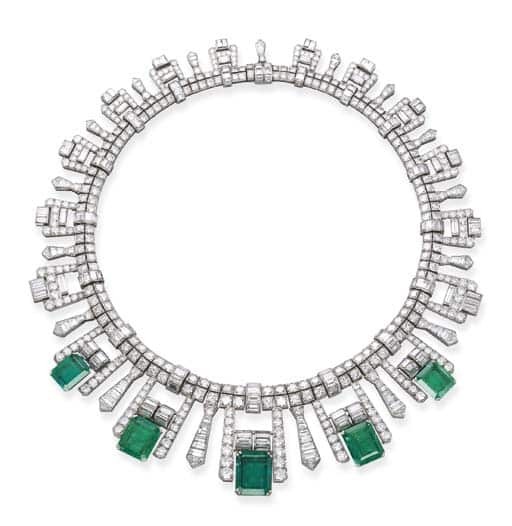 Art Deco Carved Emerald Intaglio and Diamond Necklace, c.1925. Cartier Art Deco Star Ruby, Diamond and Enamel Collar, c.1935. Shapelier fashions required shorter necklaces. Low backed evening gowns required pendants suspended from the clasp. c.1935 colored gem cabochons became the focus. Retro Gold Tubular Fringe Necklace. Fashion: tailored severe suits and practical dresses. Gold often supplied by customer. Flexible/convertible snake chain, gas-pipe and hollow designs with applied/removable motifs were very popular. 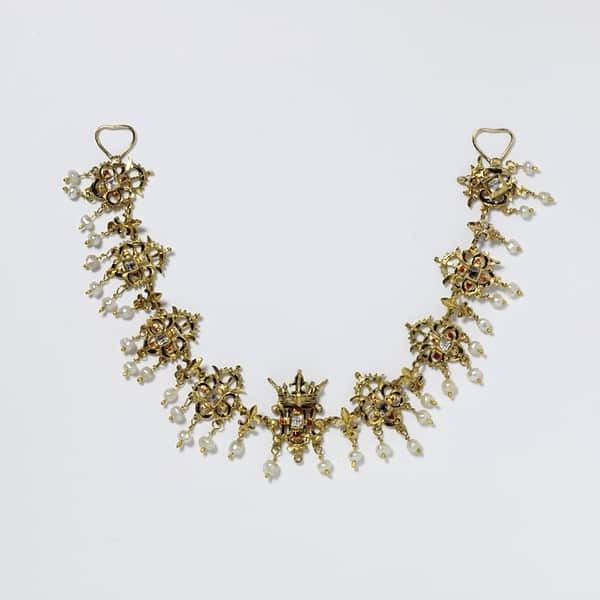 Retro Scroll Motif Gold Necklace. 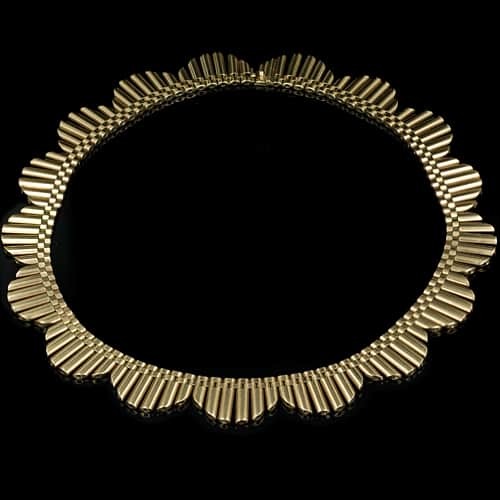 Retro Gold Scallop Motif Necklace. Recycled gems from older jewelry. Large gemstones such as aquamarine, amethyst, and topaz. 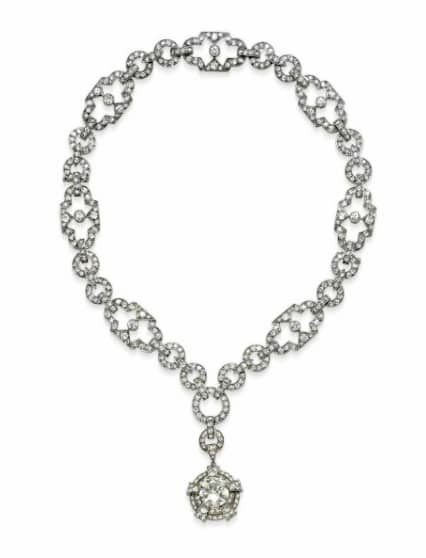 Diamond Baguette Swag Motif Necklace, c.1955. 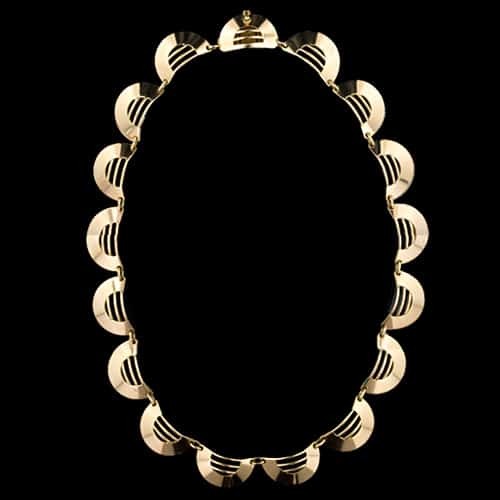 Tiffany & Co. Gold Necklace, c.1950s. Prosperous post-war period, luxury in vogue again. Feminine “puffed” skirts with narrow waistlines with emphasis on the bust-line. Shorter Necklaces with curving flowing lines often asymmetrical. 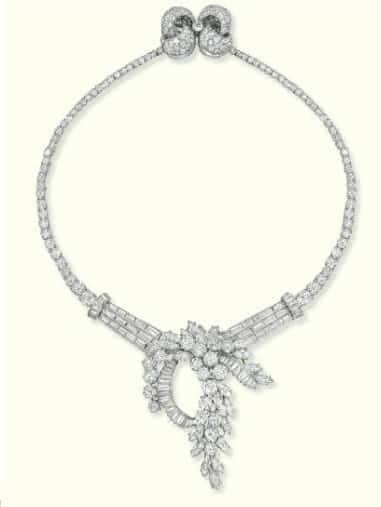 Diamond Detachable Foliate Cascade Necklace, c.1955. 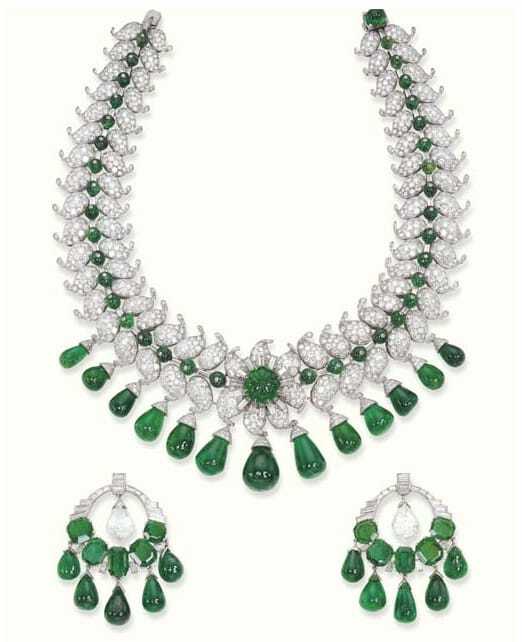 Van Cleef & Arpels Columbian Emerald and Diamond Necklace and Earrings, c.1950. Platinum, palladium and white gold. Diamonds as the primary gem were sometimes punctuated by rubies, emeralds, and sapphires. Lavish diamond rivieres supported fringes, festoons, and drops. 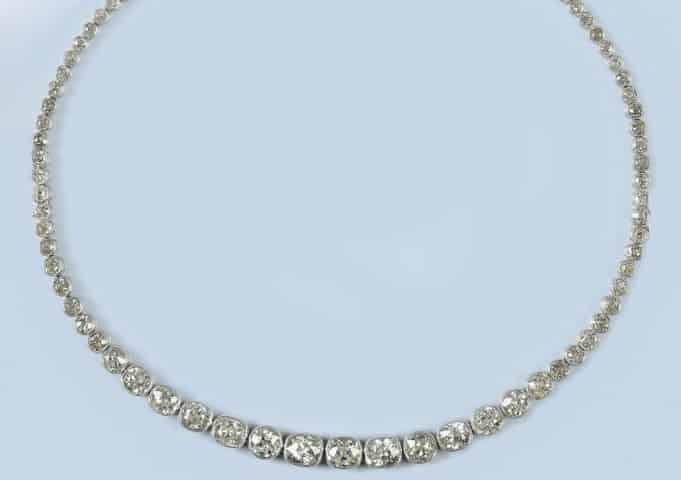 Diamond Fringe and Ribbon Motif Necklace, c.1950s. Channel-setting popular with baguettes forming lines and outlines. Gold was woven into textile-like patterns and designs with small diamond accents. Pearl necklaces were back, singly, in pairs and festooned with diamond accents. Black, J. Anderson. A History of Jewelry: Five Thousand Years. New York: Park Lane, 1975. Mascetti, Daniela and Triossi, Amanda. 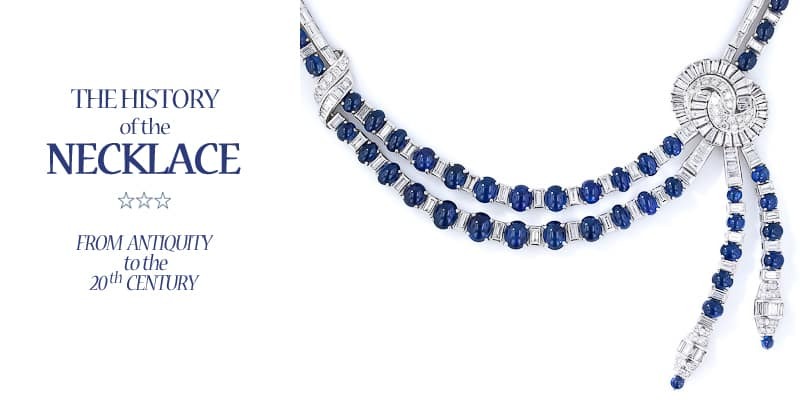 The Necklace: From Antiquity to the Present. London: Thames & Hudson Ltd, 1997. Scarisbrick, Diana. 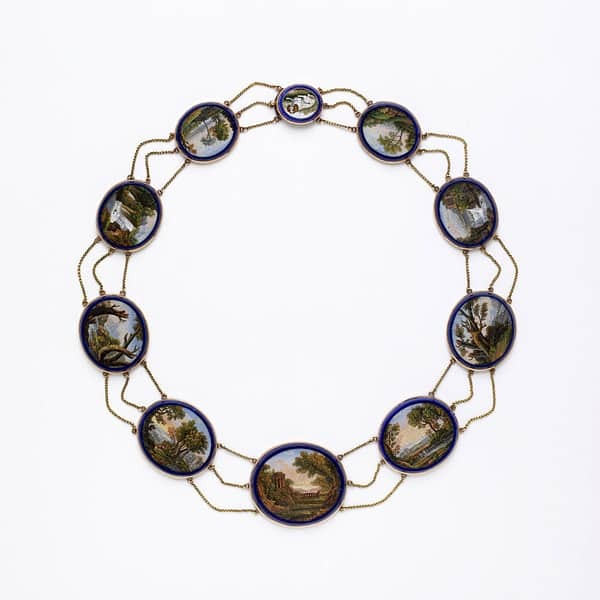 Jewellery in Britain: 1066-1837, Wilby, Norwich: Michael Russell, 1994. Pp.168-169.